Let's now raise a toast to Annie S. Peck, author/photographer, world-traveler, and the climber of many mountains , all accomplished in the early 1900s. She was a trail-blazing feminist, and adventuress. 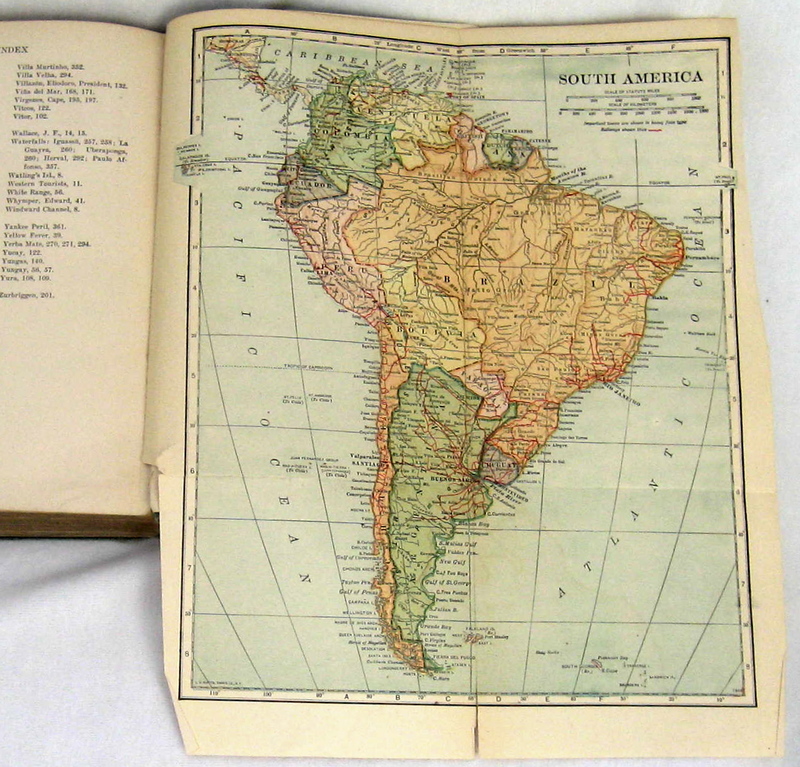 Just below is her book: The South American Tour, published in 1916 (revised from a 1913 first edition). It is a detailed travel guide to well-known and un-known South America, including The Panama Canal (prior to its opening), and such cities as Lima, La Paz, Santiago, Buenos Aires, Sao Paulo and Rio. Peck traveled by sail, rail steamer, and one would guess, some times, by foot and by horseback. And in between her various stops along her South American route, Peck climbed mountains, including, in 1908, the North Peak of Peru's Mt. Huascaran (21,812 feet, some 1400 feet higher than Mt. McKinley). At that time, "greater than any man in American has yet (1916) achieved." Peck's book is yet another wonderful example of the surprises you can find inside the covers of a well-traveled, 100-year-old book. Here, the history of the author seems equally, if not more, important than the book's contents. Reading Peck's biography, you can learn about how she planted a flag calling for Women's Right to Vote on a Peru mountain-top. And how she climbed in pants, at a time, when women wearing pants was a great scandal. Some times, Peck wore a disguise as a man, but only when it was the only way to climb with others. Peck wrote deftly about all of her experiences and often with a wry sense of humor. Her book offered readers a rare view of South America, from the ground-up. Though denied entrance to Brown University, because she was a woman, Peck persevered in her classical studies and Greek education in Rhode Island, in Michigan and in Europe. Her background helped her write knowledgeably about the countries she toured and the mountains she conquered. For all of her accomplishments, Peru awarded her a gold medal and a cigarette company created a trading card for her. But today, she is largely unknown. Found books, like this, can rectify that. 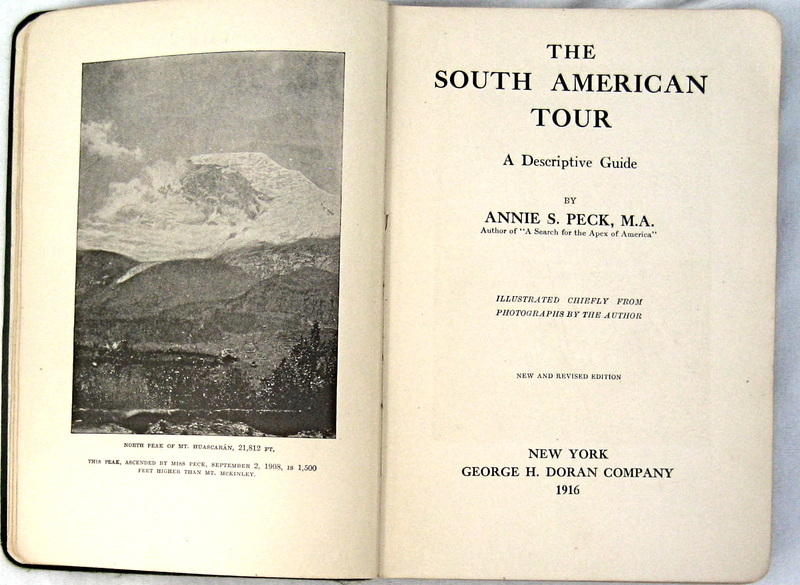 The South American Tour, A Descriptive Guide by Annie S. Peck. George H. Doran Co., 1916. 398 pages, with fold-out map. 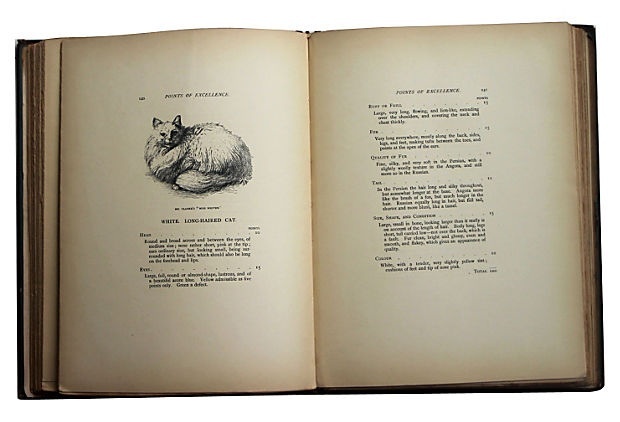 Recently, we found one of the most coveted Cat books of all time: an antique book, written in 1889 by Harison Weir the First President of the National Cat Club. Weir, also know as "The Father of Cat Fancy" organized the first cat show in England in 1871. Weir was also a famous artist and sought-after illustrator. 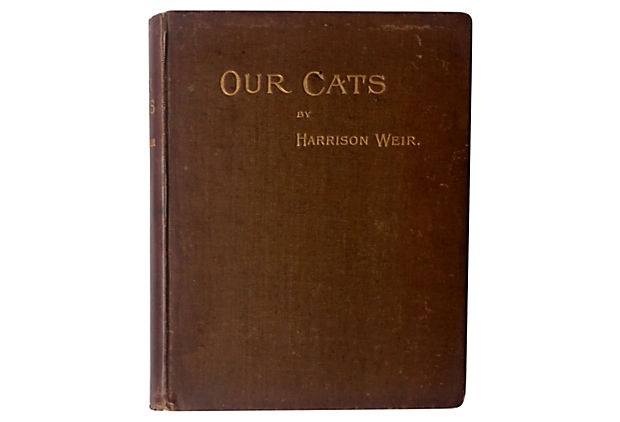 In 1889, Weir wrote Our Cats and All About Them describing and illustrating the pedigree varieties of the time. 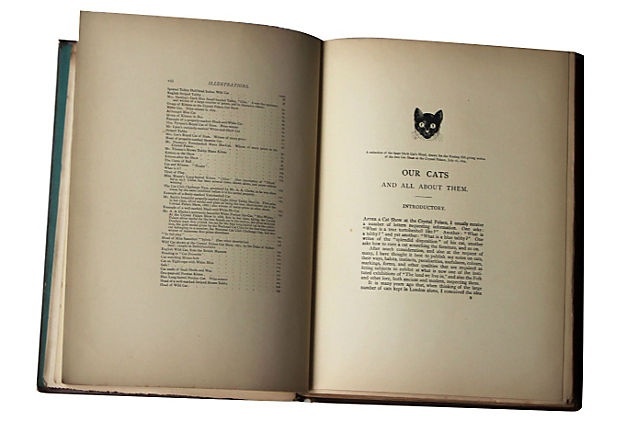 This was the first cat pedigree book ever published. 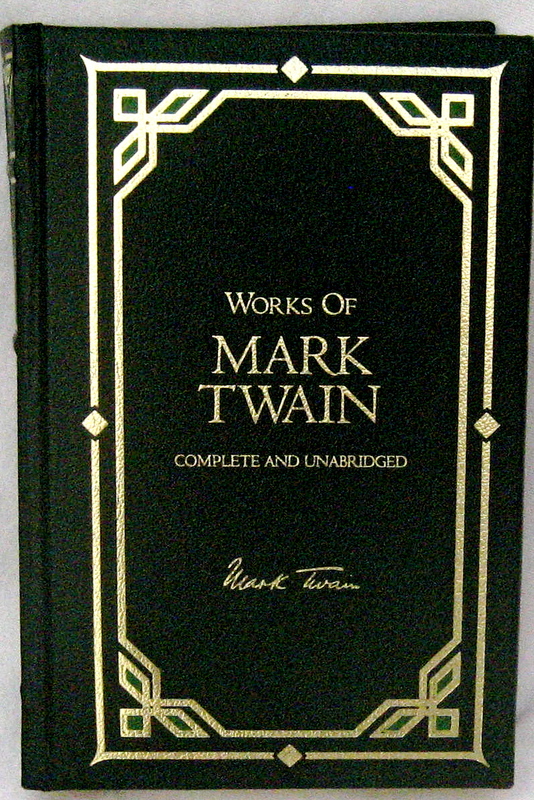 Our edition, one of 120 signed copies, was an unlikley and exciting find. This landmark study and reference work about cats is absolutely fascinating. Weir throughouly discusses cats temperaments and habits, mating, feeding, variety, scoring at cat shows, folklore, and art relating to cats. 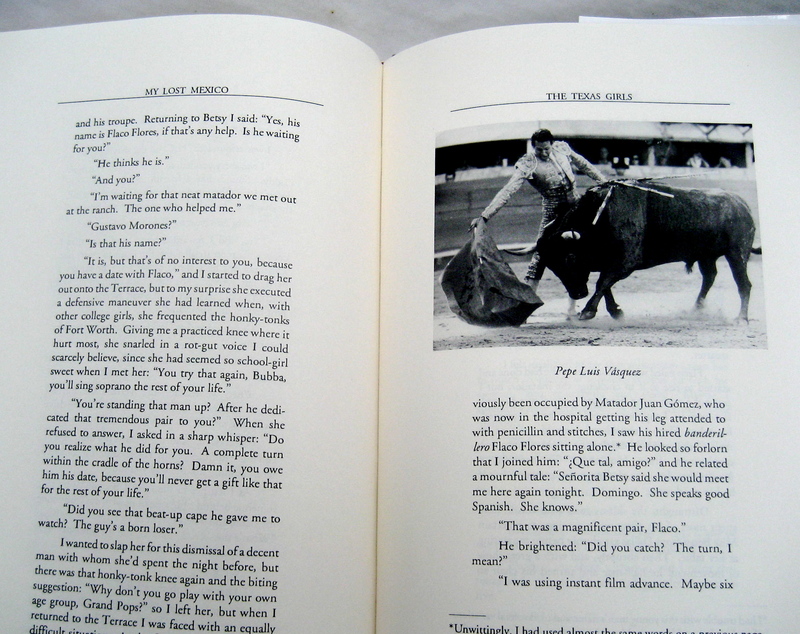 A few of the pages are shown below. This book, valued around $1,000, has already sold. Sad to see it go so quickly--but glad it's in the hands of a cat-lover who will truly appreciate its history and importance in the cat world. 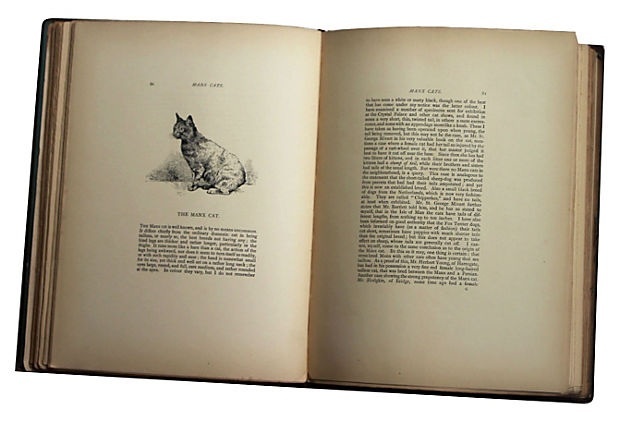 Our Cats and All About Them: Their Varieties, Habits and Management: And for Show by Harrison Weir, President of the National Cat Club, Clements & Co, 1889. Sometimes a magazine is not a magazine, it's also a book. And in this case, the #1 issue of Venture (a travel magazine first published in 1964) was bound in cloth, which made it a book. These days, sophisticated readers are not only attracted to rare antique and much-desired vintage volumes. We (and they) also are collecting old paperbacks (especially pulps) and even magazines, especially if they contain the works of not-yet-discovered authors & artists. 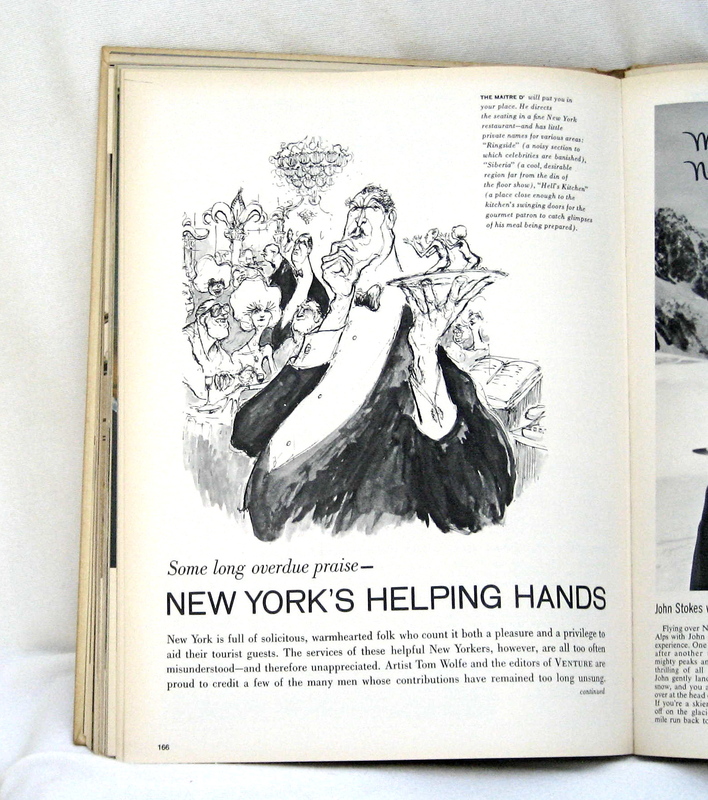 Case in point, Venture #1 which featured articles by John Knowles, then writing his second book of fiction (The Collector was his first, runaway hit & The Aristos, non-fiction,followed) and a young Tom Wolfe, who wrote about New York's "Helping Hands", and did not even merit a by-line here for his trouble. (To be fair, he was credited by name in the table of contents, but to young writers, by-lines & contributor attributions are every bit as important as the rolling credits at the front or back-end of a new movie). 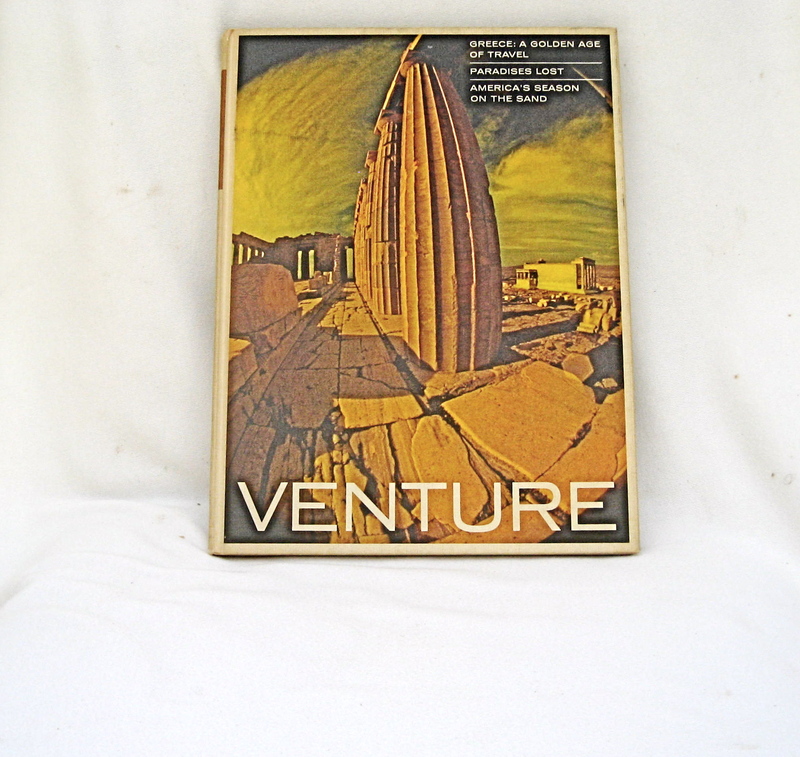 This Venture issue also contains an article by Craig Claiborne on New York Restaurants (he was an already well-known New York Times food critic, but not so much as an author of cook books . (Hee wrote many after penning the classic New York Times Cookbook). Still, a Claiborne collector (and he has many passionate fans) might relish reading this early 1960s away-from-The Times --desk critique. 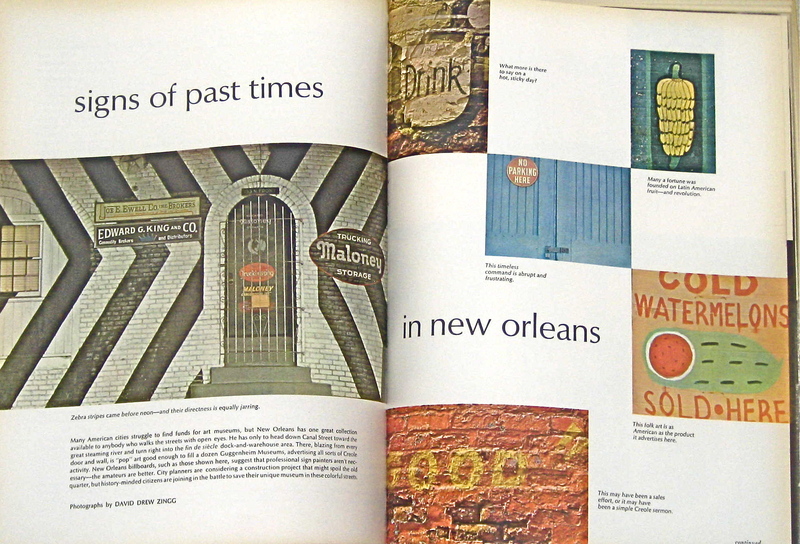 One of my favorite articles in the magazine is a photo-essay on New Orleans' old wall-painted signs, presaging the street art explosion to come that would rock the U.S. urban art core in the 1990s & beyond. 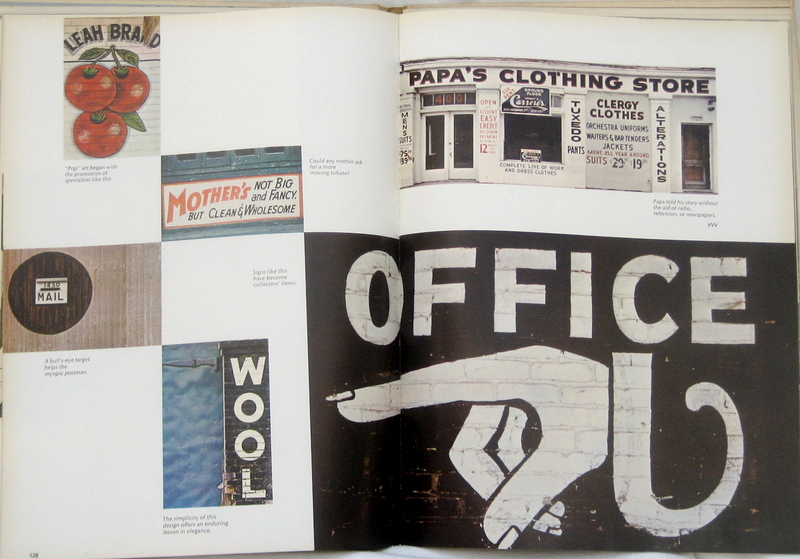 Unlike the handiwork of now well-known, stratosphere-selling street artists like Banksy and Basquiat, these art works were largely advertisements - some with words & some without: art sign-language to advertise the merchandise sold inside. It's 50-year-old magazines like Venture that can help you appreciate and understand the roots & routes now famed artists and authors took to find their calling - not always so deftly explained on sites like Amazon & Google. Over the many years we've collected books, we've run across some vintage titles others might call "odd." For example, (and for the sake of blogging),we've lugged home Is anybody listening?, Good Lord, You're Upside Down!, and, The King With Six Friends. Among others. While other book collectors might pass, as soon as we saw books with odd titles, we knew we had to have them. Love at first sight. And a love that never disappoints, even when it turns out to be not to be as first imagined. 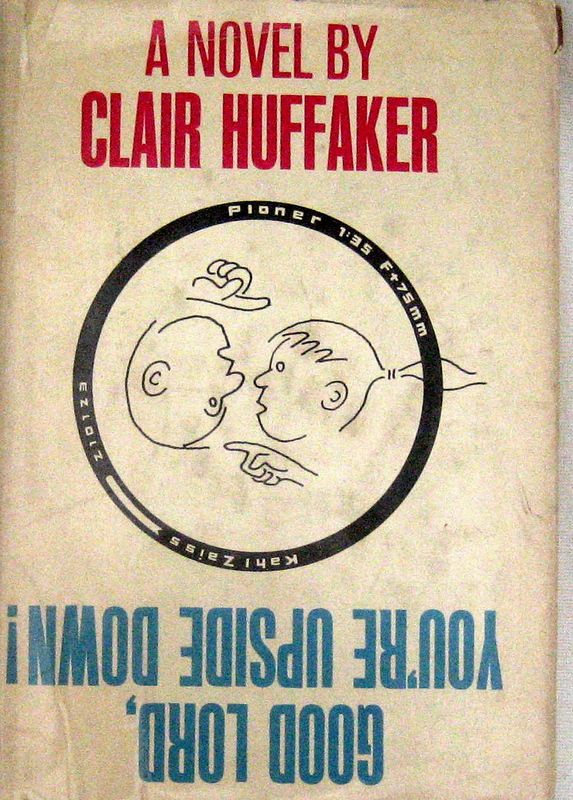 Good Lord, You're Upside Down!, is a 1963 book, written out of genre by the well-respected western author, Clair Huffaker. Huffaker's work shows up in the credits of many famous vintage Western movies like The Comancheros and Flaming Star (starring Elvis). On the blurb (back of the book), Huffaker says some of his books and scripts "have been bought by people who drink lots of martinis." Nothing odd about that. 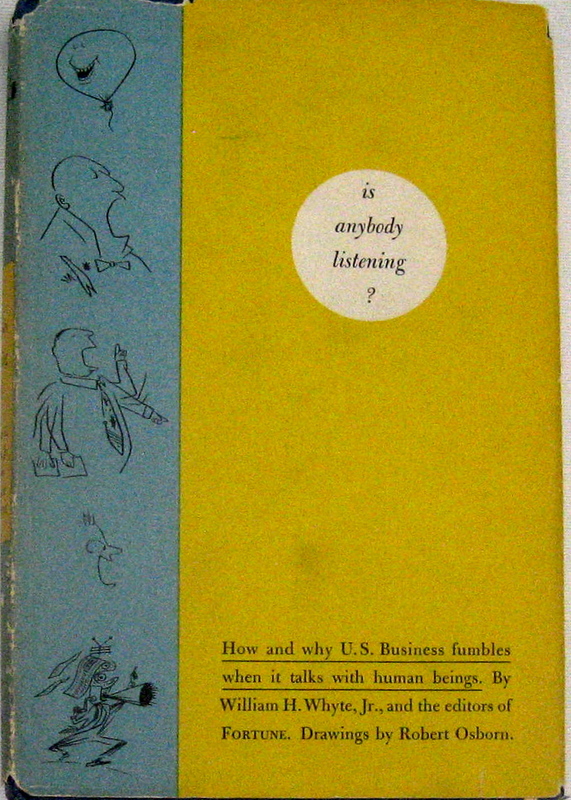 Is Anybody Listening?, was also written by an esteemed author - William H. Whyte, Jr., Assistant Managing Editor of Fortune,in 1952. Forget how timid and inconsequential the dust jacket looks, because its appearance belies the book's content. Back in the 1950s, Whyte predicted how "A new system of social engineering, through group participation, threatens us with a new and dismal kind of conformity. We are in real danger of becoming a nation of system lovers" -- Whoa, I say to that! Whyte's prediction may have seemed odd in 1952, but as he warned, we were all destined to be LinkedIn. Is that so very odd? I think not. 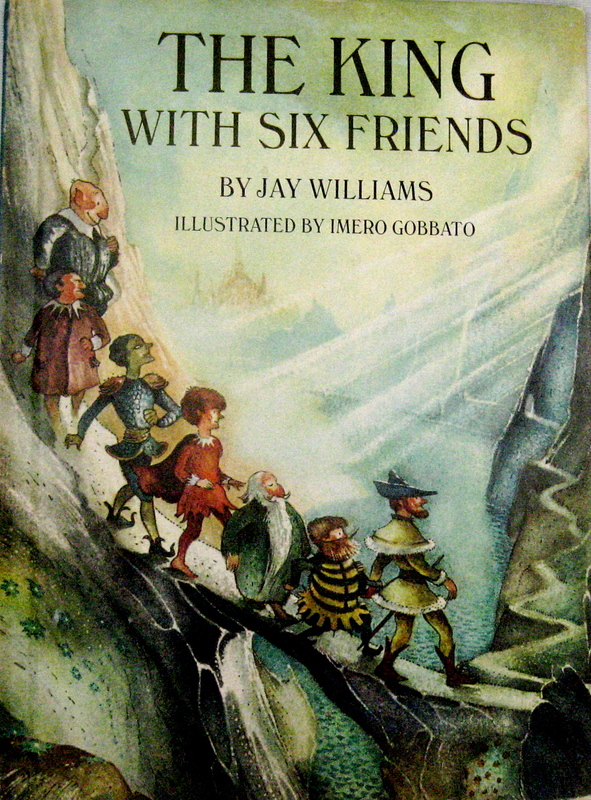 Then, there's the odd youngster in the group: The King With Six Friends by Jay Williams. Williams was a relatively well-known author of children's books, (including the co-author of the popular Danny Dunn series). Written in 1968, The King With Six Friends is about an out-of-work King. Given the nation's dreary job situation, the King's plight does not seem all that "odd." It's his new six friends who are a bit quirky. They include an elephant, a mouse and a serpent (each with magical powers). The book's oddest coincidence is that one of the King's new friends is named "KINDLE." (The guy who named the Kindle Reader reportedly said the name reminded him of a "candle." But, not necessarily). I started this blog because I was thinking a book collector does not have to be a member of The Club of Odd Volumes (Boston, 1887) to have a library full of odd books. Including some that morph, over time, into something else entirely. Woody Allen stars as the owner of a failing bookstore who becomes a pimp in order to make a living. "Fading Giglio" is an upcoming film, written & directed by John Turturro. Given the current state of the economy, Amazon and the Nook Niche, there may be more truth than poetry to this film, ( said to be released here in late 2013 or 2014). I am a fan of most movies with book store scenes (over, say, scenes in auto repair shops or cupcake bakeries). That is because, for me, books are It. Those are the movies I actually saw, but there are other notables, featuring book stores, I have yet to see (including Hugo, 2011). Plus, there are TV shows featuring books and book stores (too numerous to list here, but the recent one that come to mind is Sundance Channel's Rectify). As a book collector/purveyor, I love all bookstores, especially those on the brink of extinction. I am always rushing around, attempting to support these stores, buying, tweeting, word-of-mouthing, dragging relatives and friends in by their shirt collars. I even supported endangered book stores that weren't Independents (like the late Borders). Before Borders closed in Carlsbad, I bought boat-loads of books there and even a wooden bookcase that had once been screwed to the wall. But, as the saying goes, any publicity (or movie role, for that matter) is good publicity, so maybe Woody's turn in the Turturro movie will showcase the plight of struggling book stores - Independents and (gulp) even their big brother, Barnes & Noble. You know, we just need to get out there and shop (before they drop). In the 1940s and '50s, if you read magazines, especially the adverts, you could reasonably teach yourself to draw, collect limited edition prints of famous artists and also enrich your library by joining a book club. One of the biggest reprint publishers was Walter J. Black. 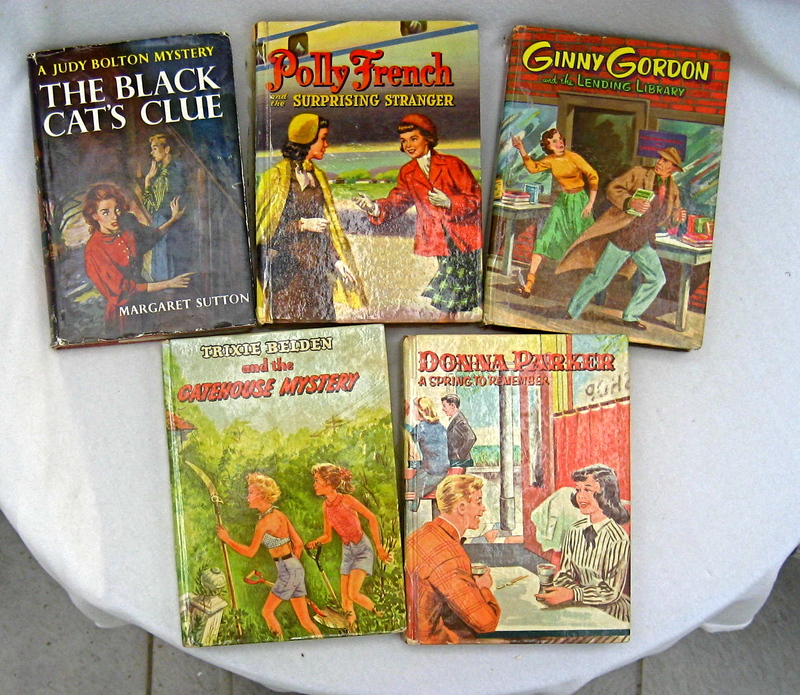 Black published book club editions of detectives, Zane Grey and often esoteric literary antiquities (The Classics Club). If you signed up to be a member of The Classics Club, you could get three free books and thereafter, as a subscriber, a book for a buck. Some of the titles in this series included the more familiar Robinson Crusoe and works by Poe. 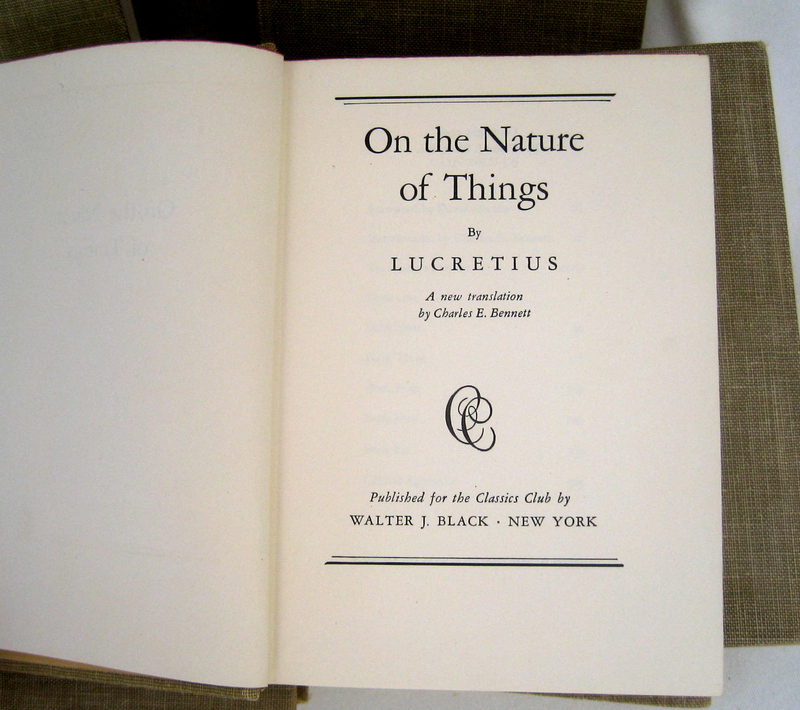 But, if you were home-colleging yourself, you could order Lucretius' "On the Nature of Things," Erasmus' "The Praise of Folly" or even "Meditations" by Marcus Aurelius. I can't say I was familiar with any of those titles. My education in philosophers stopped way, way short of Greece & Rome, settling on the more recent Sartre and Kazantzakis. 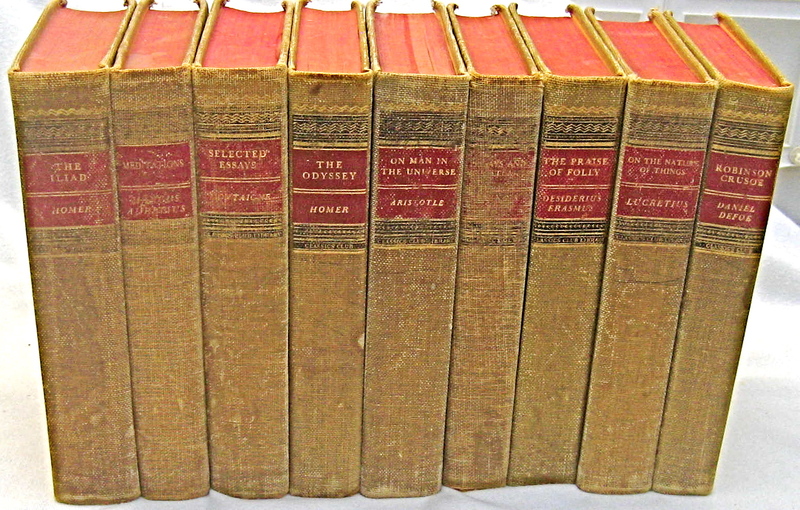 So, when I recently came across a set of nine books from the Classics Club series, said to be "Deluxe" editions (tweed cloth covers with gilt-stamped titles), I knew only one title: Daniel Defoe's "Robinson Crusoe." But I didn't buy them to read, but to sell. Look below: They are "vintage-worn" attractive; they would like good in a study bookcase. However, when paging through some of them (to check their condition), I came across the "Meditations" from Aurelius that seemed to make quite a lot of (current) sense. Now Aurelius (161-180 A.D.) was perhaps the last great Roman emperor, before the Decline. Apparently, he was regarded as a Stoic, which today, would be a good thing. But, by measure of this book, he was also a deep & prolific thinker, as were many of the authors with works contained in these classics, including Homer and Aristotle. If I had world and time enough, perhaps I'd extend my education with a home-schooled Masters in Ancient philosophy. Alas, this will not likely be the case, as I neither have time or world enough. Just ask anybody who knows me. Also, long ago, I synthesized my own philosophy into one sentence "Go with your gut." It's Written in the Stars - Or Was, in 1894 and 1928. 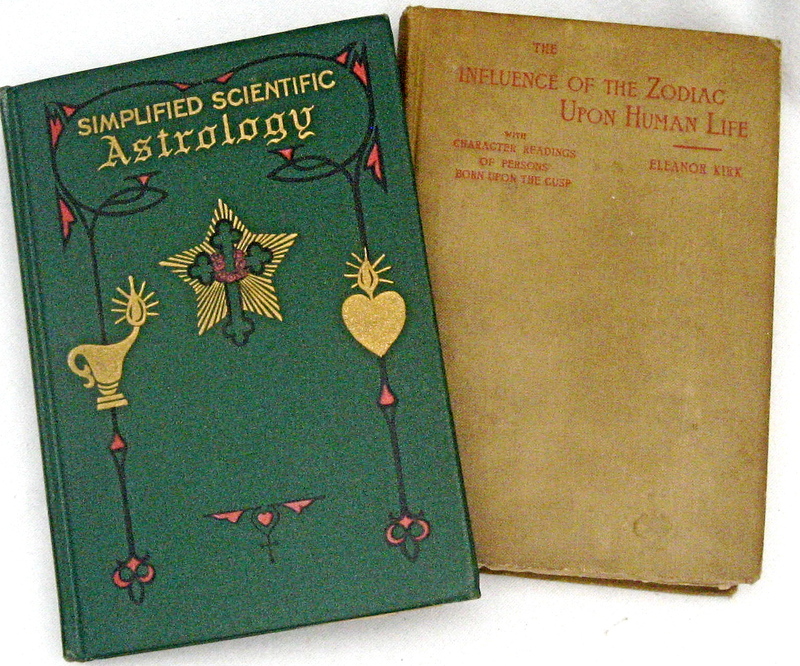 Here we have two Astrology books, and one, on the left, is better looking than the other. Kirk's book divides the 12 Zodiac Signs into the elements we all know so well (fire, air, earth and water) and then offers insights into how each Sign influences a person's life - especially when it comes to big things like marriage and work and little things like getting along with others. 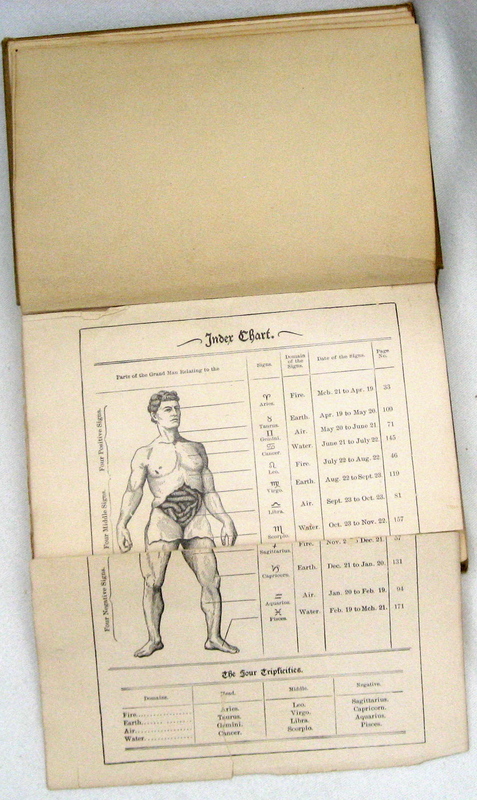 Inside this plain brown book, there's a nifty little chart showing a man's anatomy, with lines pointing to the various effects of each Sign on his body. As you can see, below, Cancer/Moon Child, (the Sign we are about to enter), is said to affect the breast. As Kirk wrote, Cancer affects the "maternal functions of the Grand Man or Microcosm." This conclusion makes a sort-of-circa-2013-sense, given so many men (probably some of them, Cancers) stay at home, these days, to care for their babies and small children, while their wives/girl friends work. But while the chart is interesting, what I like most about Kirk's 189-page book are her nearly specific Character Readings of Persons Born on the Cusp. In all my years of collecting old Astrology books, I've never come across an astrologer who gave as much thought (or paragraph space) to people born on a Cusp. Sure, Cusp births are usually mentioned in most Astrology guides, but not in as much detail as in this one. If we are talking about The Cusp of Leo-Virgo (Aug. 22-28) and, we are, Kirk describes women born in this period as "fond of everything that grows, from the babe at the breast to the seed in the ground." And Kirk describes those born on the Cusp of Aquarius-Pisces (Feb. 19-25) as "peculiar. ...Although they are "usually well and tastefully dressed," their great love of color sometimes leads them into unpleasant combinations..." (Rihanna, Drew Barrymore,Smokey Robinson). 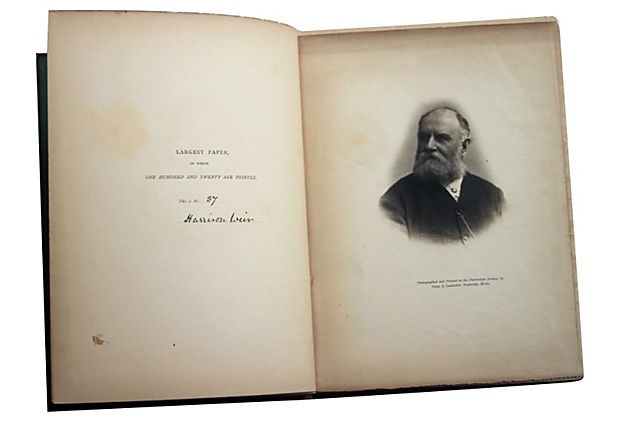 In the past, author's biographies weren't generally listed within their books. Neither of these Astrology books describe their authors. But, we can guess about them. In Kirk's case, it's likely she earned (or supplemented) her 1890s income by casting horoscopes and counseling clients about their futures as The Turn of the Century approached. (Kirk also wrote a few esoteric books, including The Christ of The Red Planet in 1901.But she is best-known for this work). The second Astrology book is Simplified Scientific Astrology. 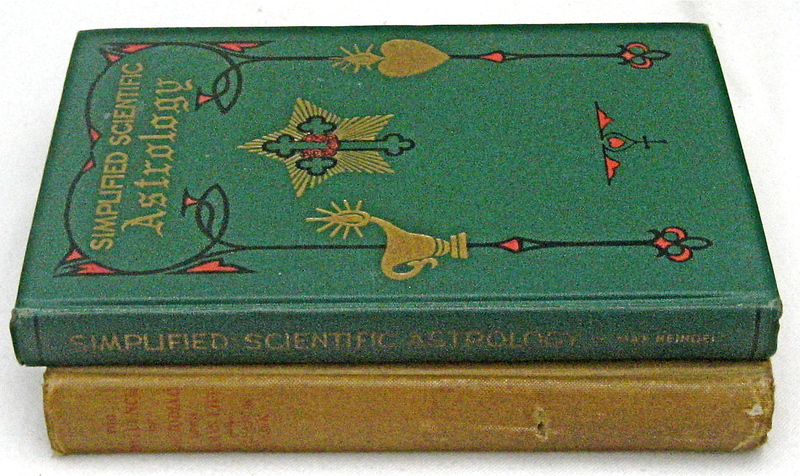 With its gold and green Art Deco cover, it is far more beautiful - but, inside more technical, offering detailed steps on how to chart a Horoscope. Written by Max Heindel, the book was published in 1928 by the Rosicrucian Fellowship. (In the early 1900s, the Rosicrucian Fellowship, which Max Heindel led, was active around these parts). Unlike Eleanor Kirk's book, Heindel's 198-page book makes for dry reading. But, there's a bonus at the end: the Philosophic Encyclopedia of Astrology (largely definitions of Zodiac terms). After reading about "Lights" (the Sun and the Moon), I learned The 14th Lord Napier invented logarithms, in the 1500s, to make his Astrology calculations easier. I always thought Napier was a brand of popular 1950s costume jewelry . But apparently Napier, in the body of the 14th Lord-Astrologer, was so much more: he basically married metaphysics and Astrology to Science and numbers. I doubt anybody I know learned his back-story in Calculus. There are Louisa May Alcott books, and then there are Louisa May Alcott books. This week, we had the opportunity to offer for sale two vastly different sets of three of her novels, published more than 80 years apart. Our Alcotts are three lesser-known novels by the Queen, or at least the Princess, of popular children's fiction from the late 1800s through today. 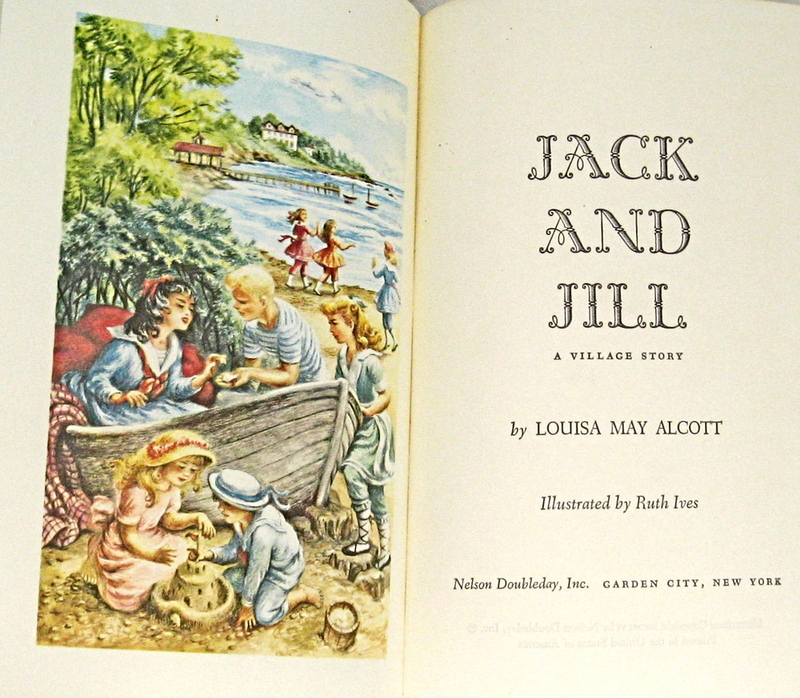 Our first Alcott set, published circa 1888, included Rose in Bloom, Under the Lilacs and Jack and Jill. 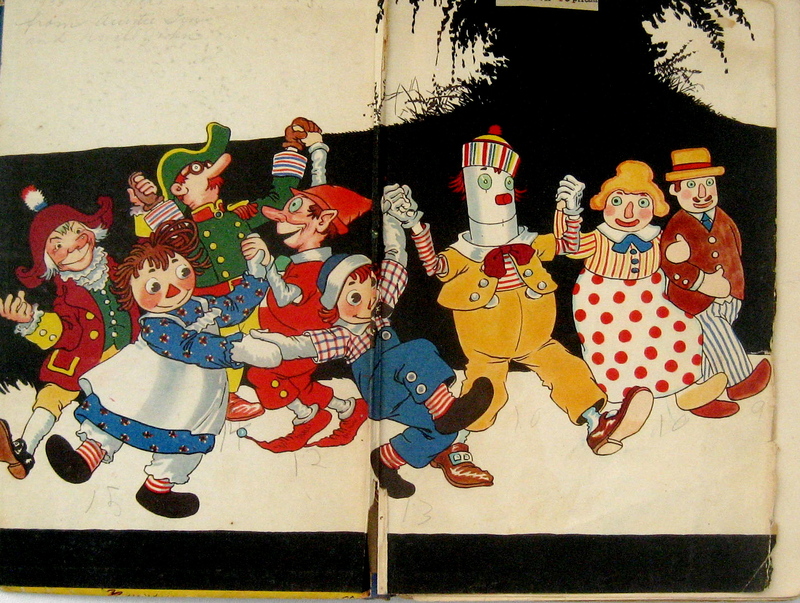 The second set, published circa late 1950s-'70s, includes "An Old Fashion Girl, Eight Cousins and, again, Jack and Jill. If books could fly, the antique set, see just above, flew out the window, almost as soon as the window opened for sale. The more contemporary set, "vintage" (pre-1989) as we call it, is on sale now. 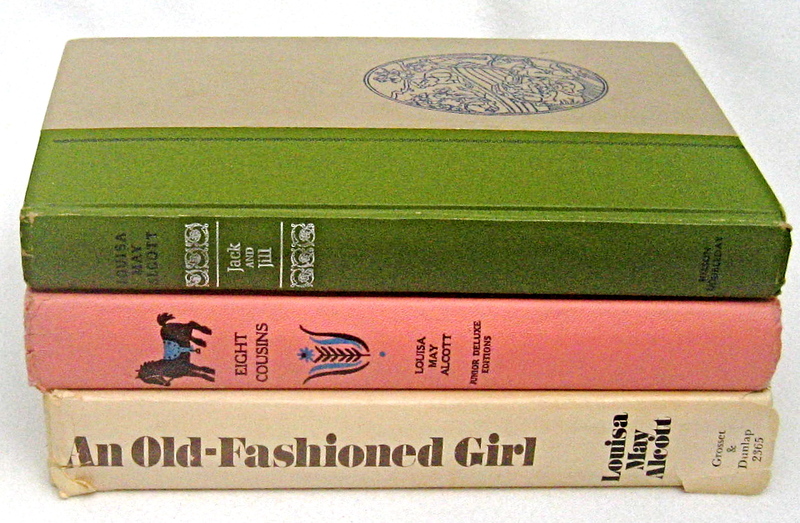 Children's books from the 1950s, in good condition, and by well-known authors, generally find their new owners as fast as you can say "Louisa May Alcott." Maybe not as fast as the 1880s version, but vintage children's books, in good condition, have "legs," as well they should in the eBook generation. Although neither of our Alcott trios includes the more famous Little Women or Little Men, Alcott's books are every bit as popular today as they were back in the 1950s, and before then, back in the late 1800s. There aren't many female children's authors who weather the decades like Alcott. I think of her as a literary Mary Cassatt. Nurturing. 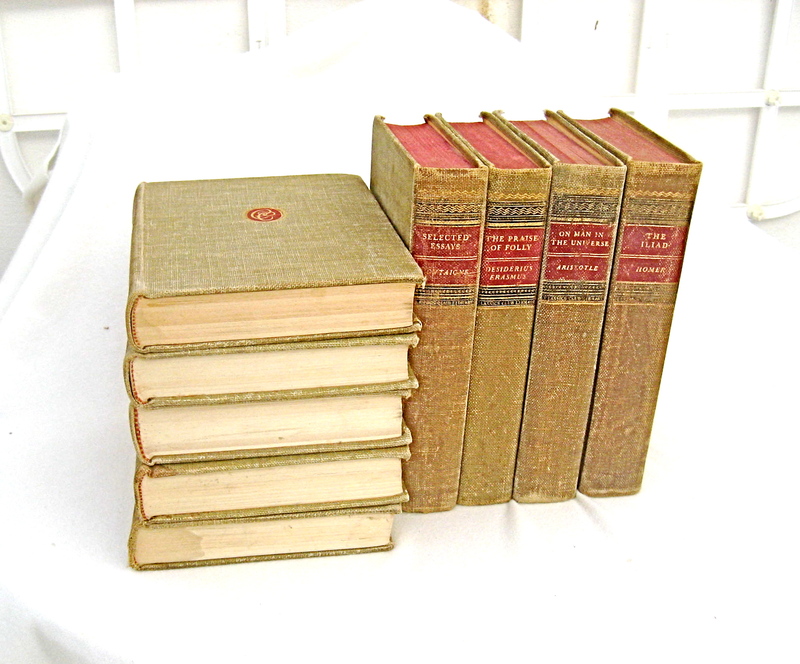 Sophisticated Reader's Note: The second set of Alcott books, sold like the first set, within 2 1/2 hours of being listed for sale. There are two of us, Sophisticated Readers, living 100 miles apart. We are online only, when it comes to selling, but hands-on only, when it comes to selecting our books. Some times, we experience an ineffable mystery of connection to our finds: an indescribable cosmic link between us, the pickers, and the books we pick. Once, at an outdoor book sale in Carlsbad, in the midst of thousands of books piled high on folding tables, I put my hand on an uncommon Charles Bukowski book of poetry: a birthday gift for Sophisticated Reader #2 who avidly collects him. Another time, in Los Angeles, at a thrift store, while out picking books with Sophisticated Reader #2, a Bukowski book fell off a book shelf and landed on top of her head. Luckily, it was a soft cover. Also, luckily, it was autographed by Sean Penn. You can feel the magic when this happens. "Wait a minute!" the inner voice commands, as if this coincidence, this Jungian synchronicity, could not have happened the way it did. Moments like this are memorable because they are random and infrequent. But recurring. Of course, they do not always involve Bukowski (although wouldn't that be nice)? 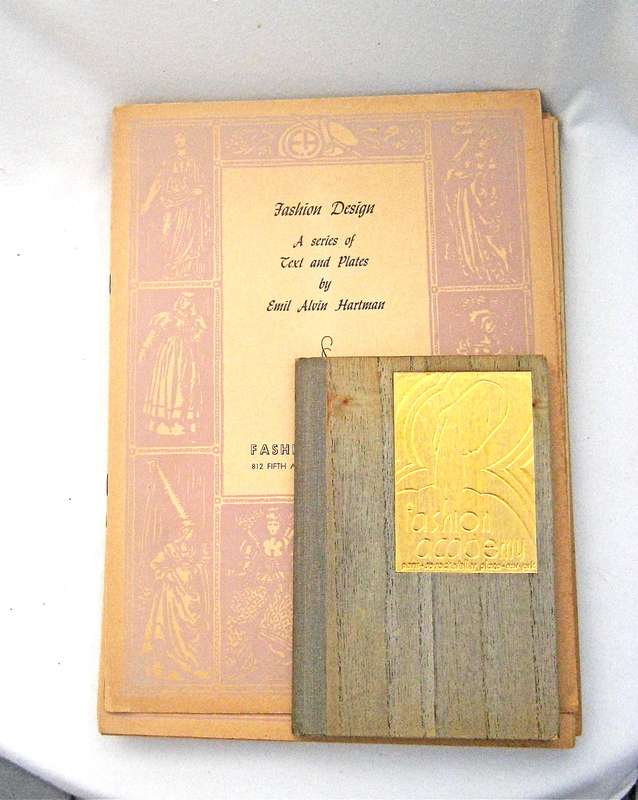 Take the set of Art Deco Fashion Design books, above, we are now selling. 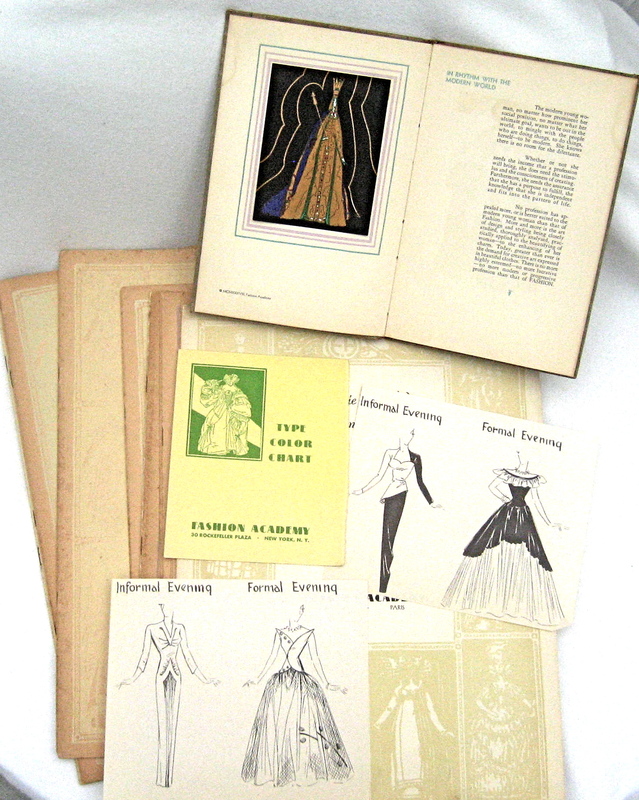 The scarce set includes both 17 softcover correspondence-school lessons in fashion design (1930s-'40s), plus a 1938 hardcover fashion design book by the same author & publisher. 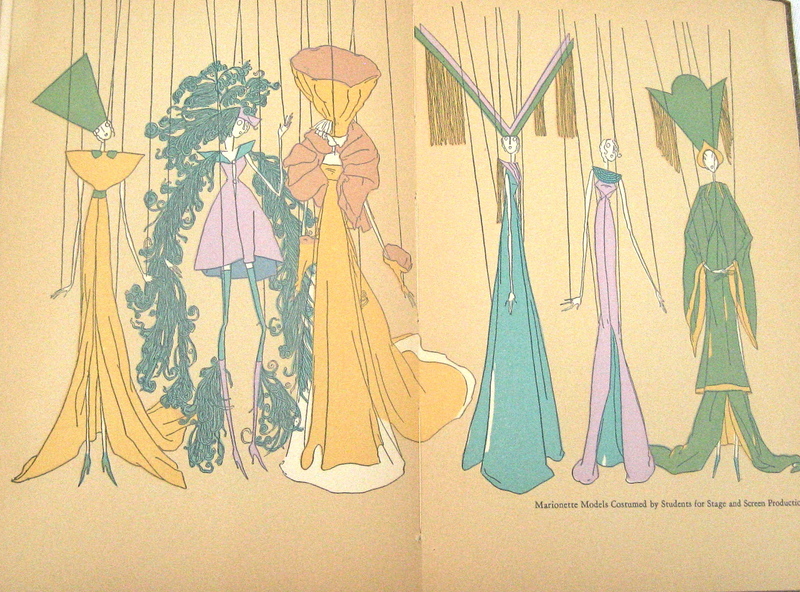 The hardcover is illustrated , with a surprise bonus of a valuable Deco pochoir fashion plate, tucked inside. The magic in this pick is that I bought the softcover design-class books in March at an auction in Vista. Sophisticated Reader #2 bought the hardcover recently, at a sale of antique books in Glendale. Our picks were months and miles apart. The books are only, now, re-united, as if there had never been any time or distance between them. They belong together. Over the many years Sophisticated Reader #2 and I have collected, we've never run across these titles. Sophisticated Reader #2 didn't know I had purchased the lot of fashion design correspondence books, until she told me about her Art Deco fashion design find. But, her book, when added to the school lessons I already had, greatly increased the books' combined value, for more than one reason. To paraphrase, the great Kurt Vonnegut, "If this isn't magic, I don't know what is." On the other hand, there are certain vintage cookbooks I collect that are definitely not in the dreamy category. 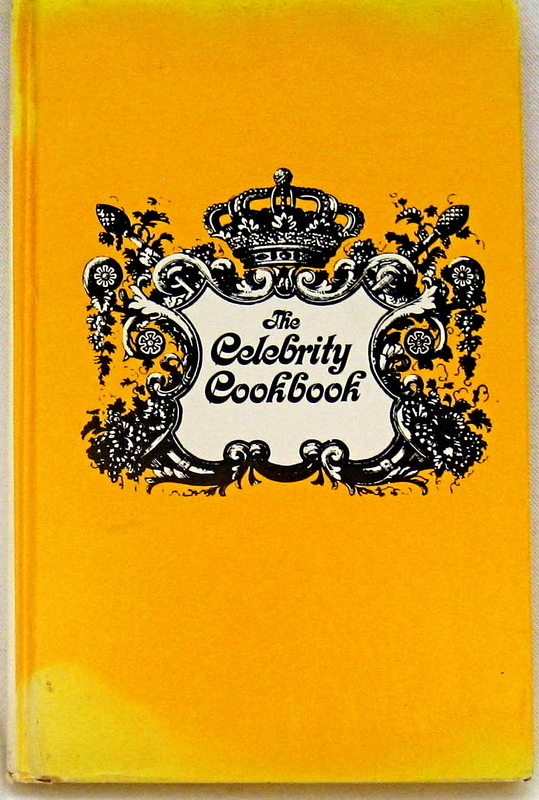 This is the case with Dinah Shore's The Celebrity Cookbook, a far cry from Disney. Alas, no brilliant color photos to dream over. Published in 1966, the book is aged and worn, like a starlet who just couldn't get a part. The dust jacket is tattered. There are a few stains, here and there. But, if you don't or can't cook like me, this book is dual-purpose. Not only does it contain quaint old-school recipes, it's a great reference for autograph and entertainment collectors who avidly seek authentic signatures and ephemera. Illustrations aside, this book has a certain panache. Or should I say, "ganache." 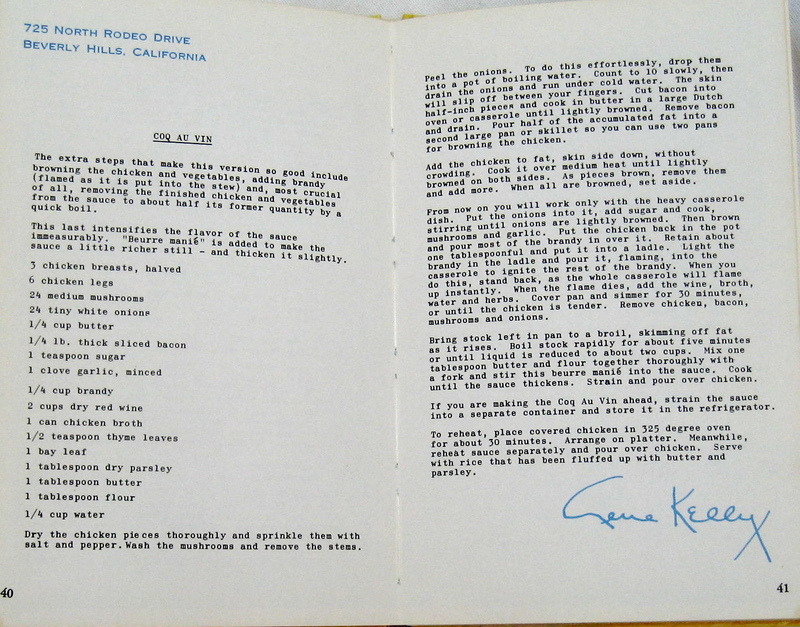 For starters, there's Jacqueline Kennedy's recipe for Waffles and Bette Davis' Red Flannel Hash. 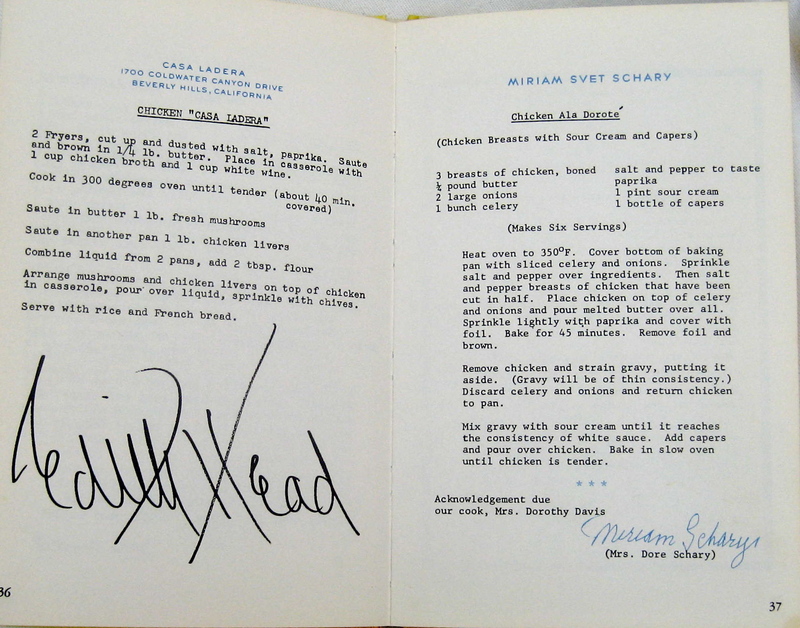 Then, there's Edith Head's Chicken Casa Ladera and Lucille Ball's Persimmon Cake. 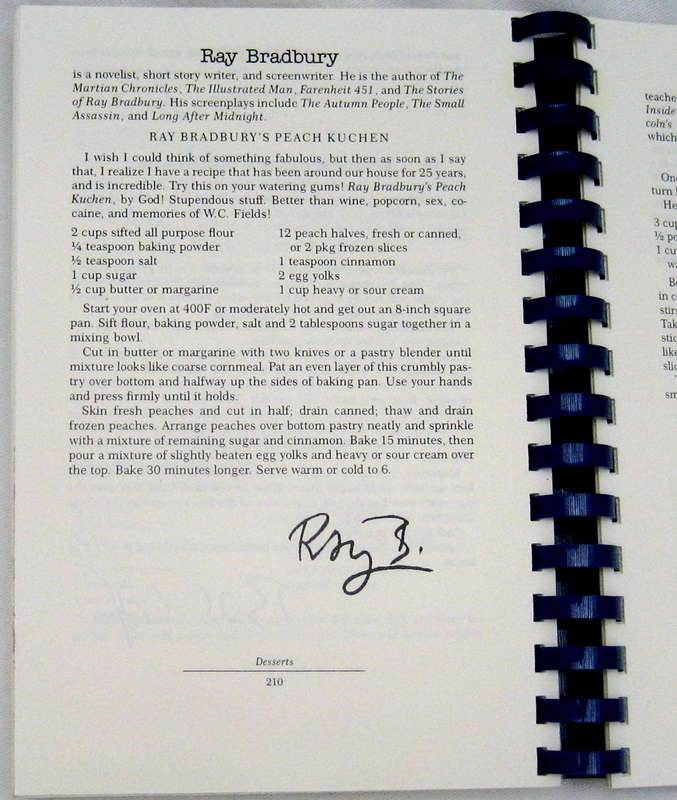 Each recipe was signed, when submitted to Dinah for inclusion in this book, and later printed in facsimile. So, with the help of this book, you can compare Sandy Koufax's signature to the one on the baseball you are thinking of buying. (Never mind his recipe: boiling water for coffee). The other most charming fact about this book is that it features the home addresses of many late celebrities. Gene Kelly, the great dancing star, lived on North Rodeo Drive, presumably cooking up some Coq Au Vin in the kitchen. The great writer, Fannie Hurst, lived & cooked on West Sixty Seventh Street in New York. Dean Martin , who contributed Martin Burgers (plain hamburgers with a side of chilled bourbon), lived on Graciosa Drive in L.A. Not every famous person/politician's address was included with their recipes, but enough of them to whet a paparazzi's appetite (had they existed, back then). So, yes, the 1960s were simpler and more idealistic. People shared. Not only their recipes, but their addresses. And, this book, with its personal details, is witness to that. And, like that. 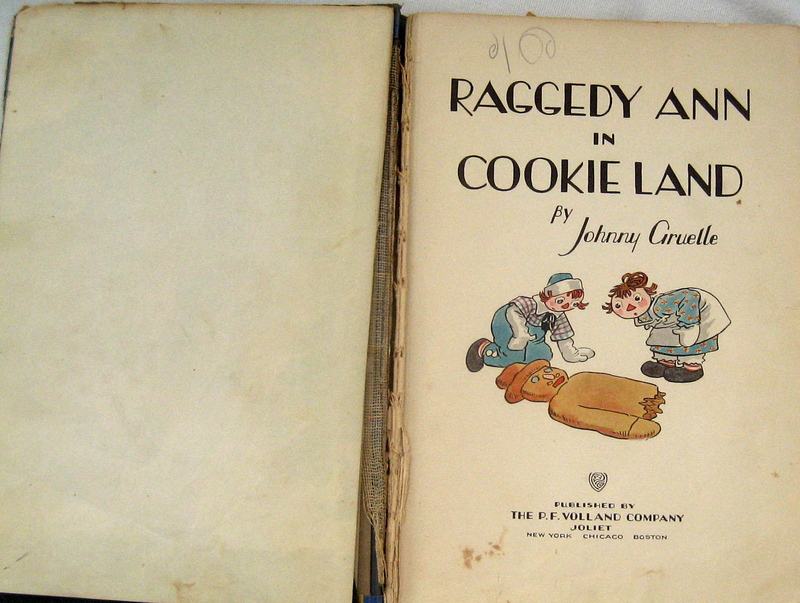 Behold a copy of the original 1931 book, Raggedy Ann and Cookie Land. 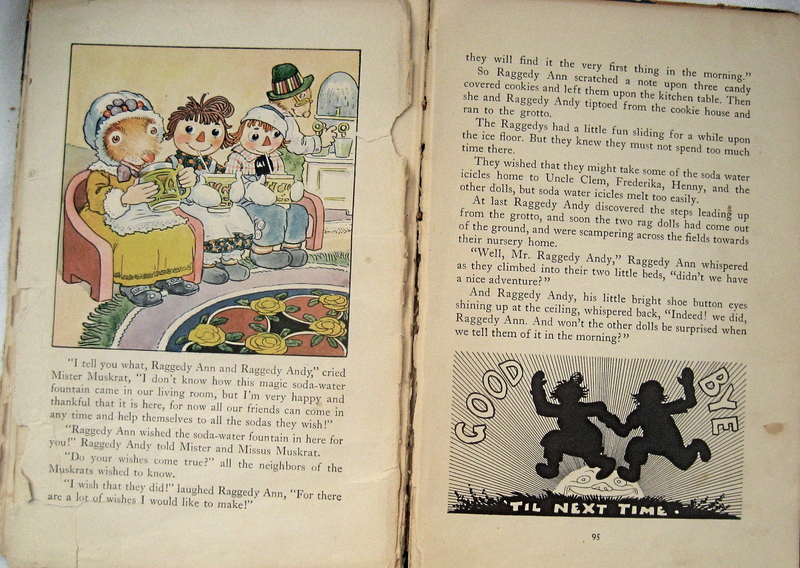 Written by Johnny Gruelle, after the doll he designed in 1915 for his daughter, Marcella, this is one of the more prized vintage Raggedy Ann books. If, and this is a big IF, it had its original box and was in excellent (likely unmarked) condition, it might sell for $1000 or more. But this copy is likely far raggedier than the original rag doll whose face Gruelle artfully first decorated for his daughter. It is said that after Gruelle created the doll's face, he decided to name her "Raggedy Ann" - a combination (or should we say unsolicited collaboration) between James Whitcomb Riley's famed poem, "The Raggedy Man" and the popular cartoon, "Little Orphan Annie." Copying (borrowing) is always the sincerest form of flattery - or in Gruelle's case, genius. My copy, found at a sale of antiquarian books, was marked $1 due to its condition - which, if I were being truthful, (as I am, always), would be considered South of "Poor." 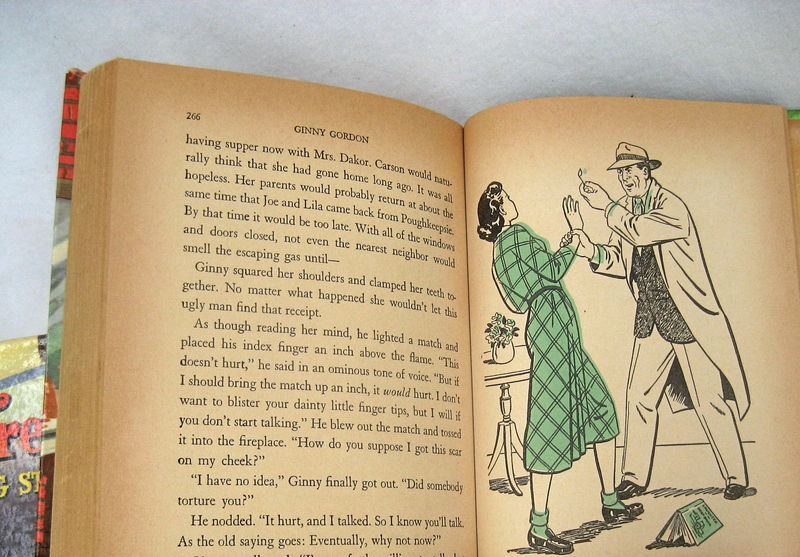 First Edition aside, its hinge is weak, a few pages are loose and/or tattered, and some still bear the grimy fingerprints of the 1930s-era children who owned this. 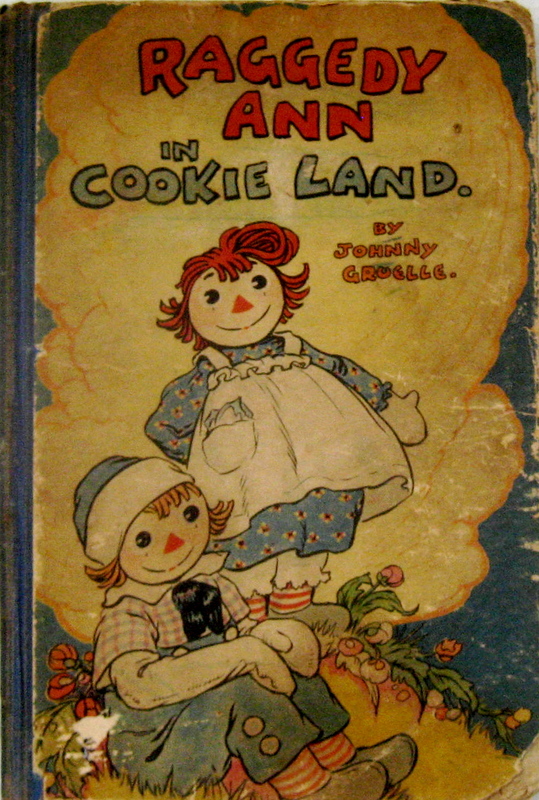 Nevertheless, as a fan of both Raggedy Ann and of cookies, I snapped up the book, as fast as you can say "Ginger". It has value to me - not only sentimental value, but also as a very good reminder about future book scouting adventures. Paraphrasing the old saw about buying real estate, there are only three words that must be considered when purchasing an old book for value. And those three words are "Condition, condition, condition." The Castro Conundrum: Who Wants This Book? Every once in a while (or maybe even more than that), I come across an interesting vintage book, which I am compelled to buy, not always knowing why. This small volume, Fidel Castro's History Will Absolve Me!, is an example. Published by Lyle Stuart in 1961, at 79 pages long, it is a quick read if you are interested in the volatile history of Cuba and its longtime leader, the controversial Fidel Castro. 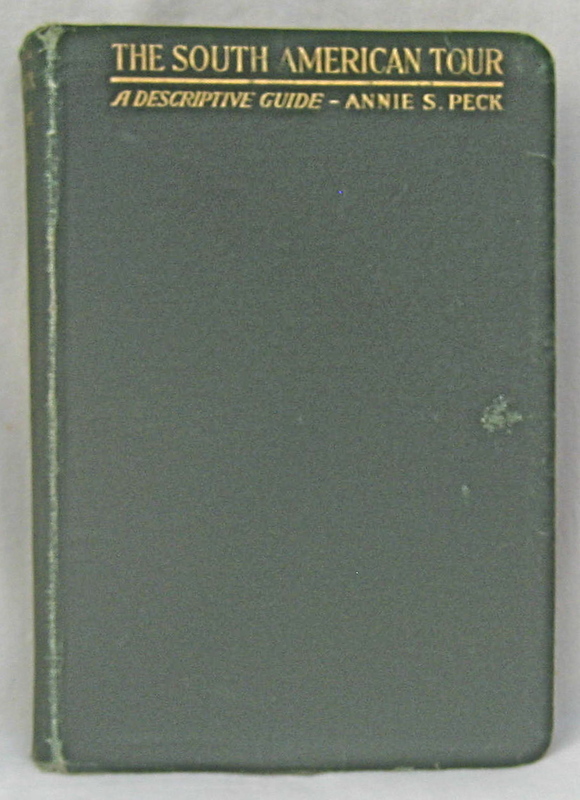 The contents of this book consist entirely of Castro's five-hour-long speech to the court, when on trial, in 1953, for leading an unsuccessful uprising against General Fulgencio Batista y Zaldivar. The speech (which I have not read in entirety), is, a first glance, complex, rich in historic detail, and even somewhat professorial in tone. 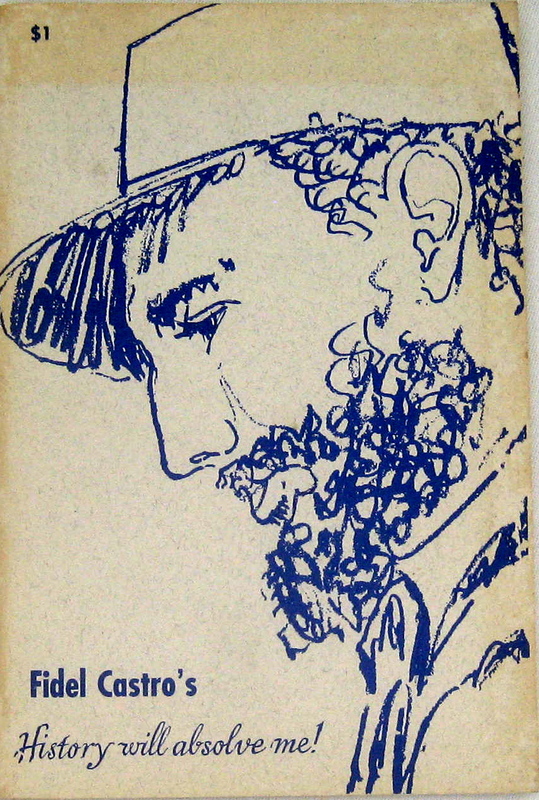 In his foreword,Robert Taber describes a meeting with Castro in 1957, where Castro described "the little book" he had written in 1953, during months of solitary confinement in jail, before his trial. Under close guard in prison, he wrote the text in lime juice, invisible, between the lines of ordinary letters in his possession. "You would be surprised," Castro said, "how much trouble it was. I could write for only twenty minutes or so each evening at sunset, when the sun slanted across the paper in such a way as to make the letters visible, glistening on the paper." Castro's motivation, Taber writes, was to preserve the history of the defense he "delivered entirely ad lib and without the benefit even of notes." As Taber writes, acting as his own attorney, Fidel Castro not only held the courtroom spellbound, but the book arose out of "Fidel's own ingenuity and gift of total recall," supplemented (of course) by the records of shorthand reporters present at the trial. The book ends with Castro's memorable summation: "...I do not fear prison, just as I do not fear the fury of the miserable tyrant who snuffed life out of 70 brothers of mine. Sentence me. I don't mind. History will absolve me." Therein resides my conundrum. I now own an important book on Cuba, potentially of interest to researchers and historians. But I can't sell it. I'm reticent, given both the subject and the subject matter. Perhaps, down the road, time will change public opinion, and I can then put it up for sale. But, for now, the slim little volume sits on the shelf, biding its time, in a sort of literary confinement. Here's a picture of my new favorite cookbook: The Art of Chinese Cooking. It didn't sell recently, and boy, am I happy about that! Yesterday, I scooped it out of the failed-to-sell pile and hurried it over to a place of honor on my kitchen counter. Because, I believe,without doubt, it will turn me into a more accomplished cook, as fast as you can say: "Better that a Man should wait for his meal, than the meal should wait for the Man." (ancient Chinese proverb, according to the book). Thus far, after many, many years (but who's counting? ), my culinary efforts currently consist of killer meat loaf, killer tuna noodle casserole, killer potato salad, and if I am very motivated, killer Quiche. 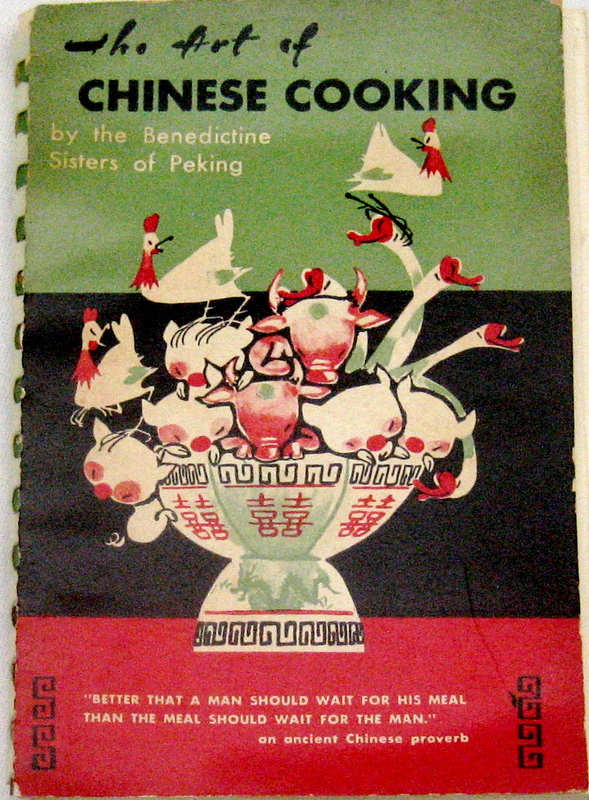 But when I discovered this charming cookbook,I realized it was time to move on to something more exotic and challenging (at least, in terms of cooking): Vintage Chinese Food! 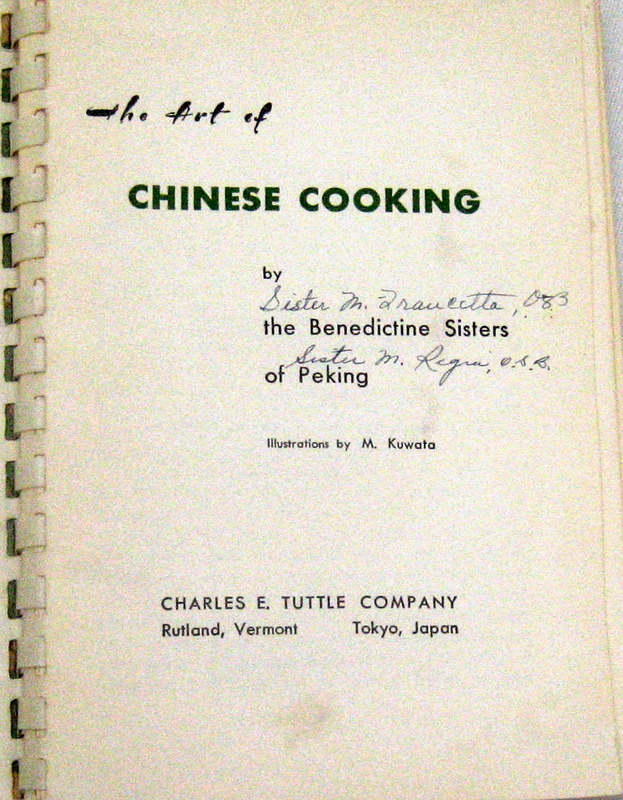 Who better to teach me Old-School Chinese Cooking than The Benedictine Sisters of Peking, who not only wrote this 94-page, spiral-bound book in 1956, but signed it, also (see the Title Page). According to the blurb on the back, "These two delightful and courageous American women (Nuns) came to Japan from a war-ravaged China with little else than their skill in Chinese cooking. To earn their living, they started to teach, and, as their celestial cuisine won (so much) fame in Tokyo, they could not keep up with the demand...." This cook book, the blurb continues, contains their Secrets and their Tricks of the Trade. "Use them - and good eating." I ask you - isn't there something so motivating about Chinese cooking secrets divulged by the Benedictine Sisters of Peking? So there it is - in a chestnut shell! I am about to embark on DIY cooking. Tonight I start my culinary journey by creating Chicken with Eggplant, or, Chi Ch'ieh Tze , as it is also known. 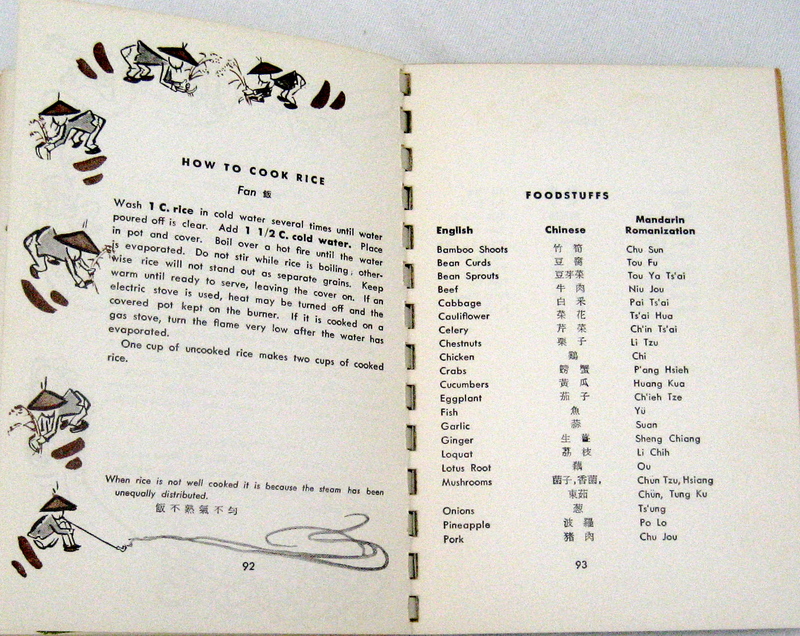 Once again, I am so very glad a vintage Chinese book collector or cookbook collector did not recognize the potential and promise of this charmingly illustrated little cookbook. Because soon, very soon, I hope, with the encouragement of the Sisters, I will get the Rice right. Charlie Trotter's (1994) is one spectacular cookbook - in fact, the most beautiful in my entire vintage cookbook collection. Although just a few years short of what is now considered "vintage" (the 1980s), this cookbook, as it ages, will likely still reign supreme among the most beautiful. It is that gorge. Lest you think I don't know what I'm talking about, let me say I've been collecting and selling cookbooks (older and newer) for decades. Among them, Julia Child First Editions, the vaunted early Larousse, the ever-popular Vincent Price cooking volume (A Treasury of Great Recipes), early Betty Crocker books, and so on. Over the years, I've developed an eye for food beauty, even if I lean mightily towards the 1940s graphics (both illustrated and photographed) in cookbooks of that era. Over the years, within my own collection, I've developed a sub-genre: artist cookbooks. 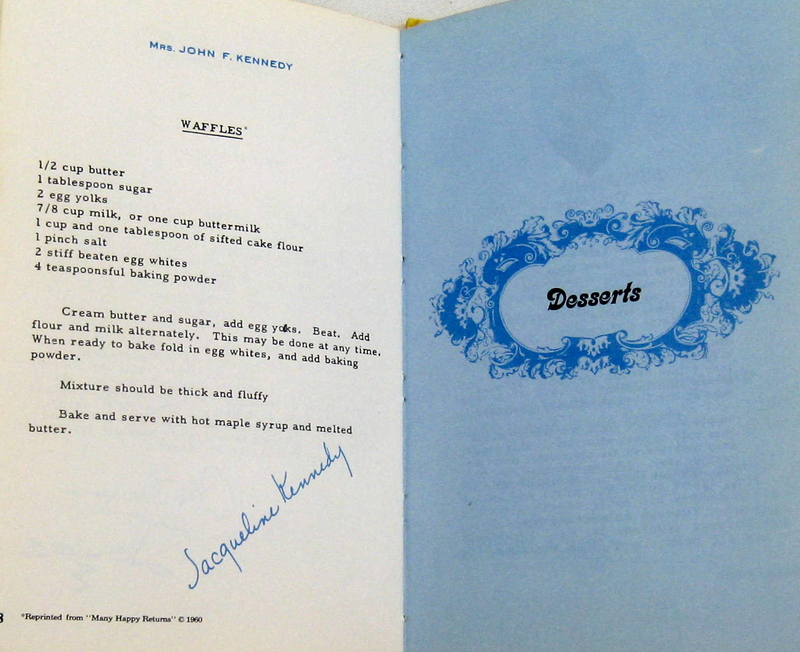 These include recipes from Georgia O'Keeffe, Monet and Picasso, artist anthology cookbooks, and so on. 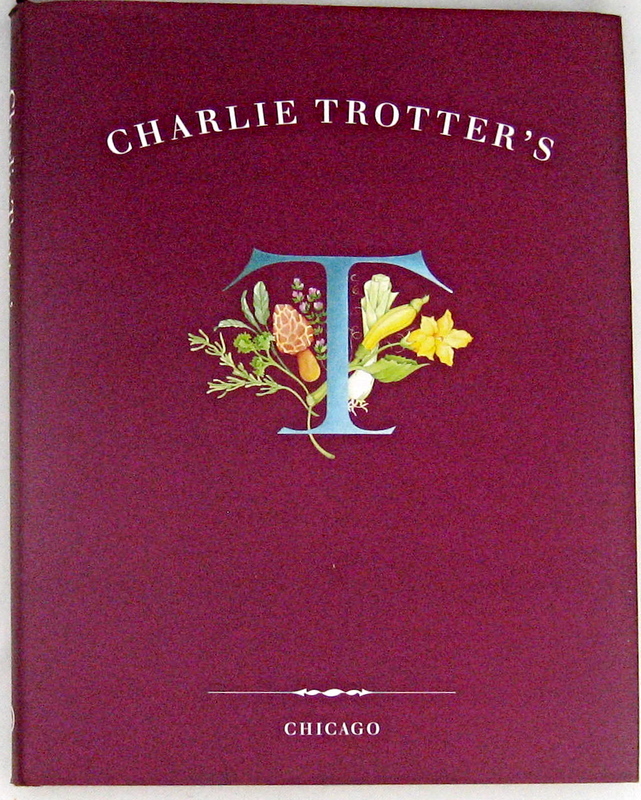 But given all of the cookbooks I've bought, sold and am now selling, I have to say, I never saw a cookbook as beautiful as Charlie Trotters. Please consider this my homage. Nominated at least 5 times for a James Beard award for food photography, Turner elevated Trotter's food masterpieces into four-color plates worthy of framing (at least, I think so. but, mais non, I would not). If you are a foodie, Hunt high & low for this book, as it is likely to grow in esteem. It's a treasure. As the old saying goes, "Writers write," and, so I suppose, Cookers cook, and some times they do both. When I'm in the mood for a laugh or even a self-indulgent "I can do better than that," I turn to one of my most-treasured books: The Great American Writers' Cookbook. 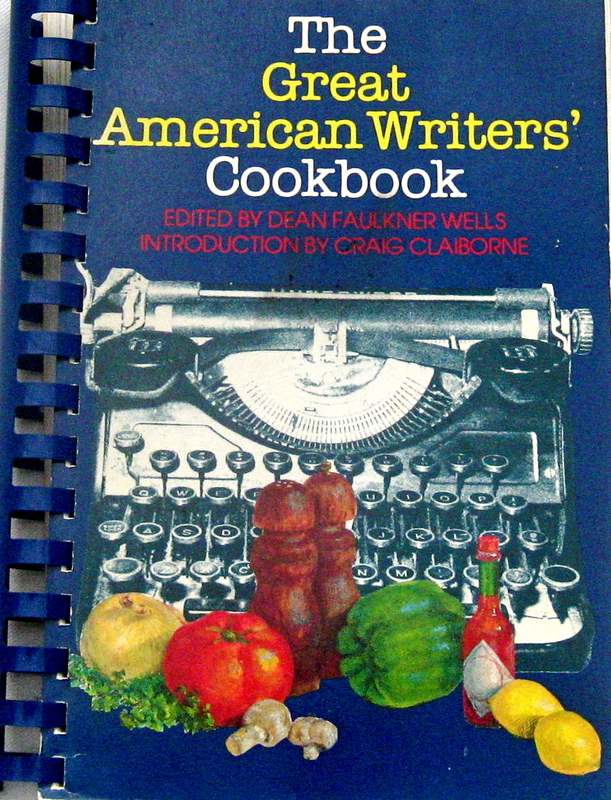 Inside this 1981 spiral-bound beauty are 200 "recipes" from 175 writers, including those alive back then, and those not (Ernest Hemingway, for one). The recipes range from Appetizers and Beverages to Soups, Stews, Meats, Poultry & Game, Seafood, Eggs & Pasta, Vegetables, Breads & Cereals and (as all's well that ends well )- Desserts. 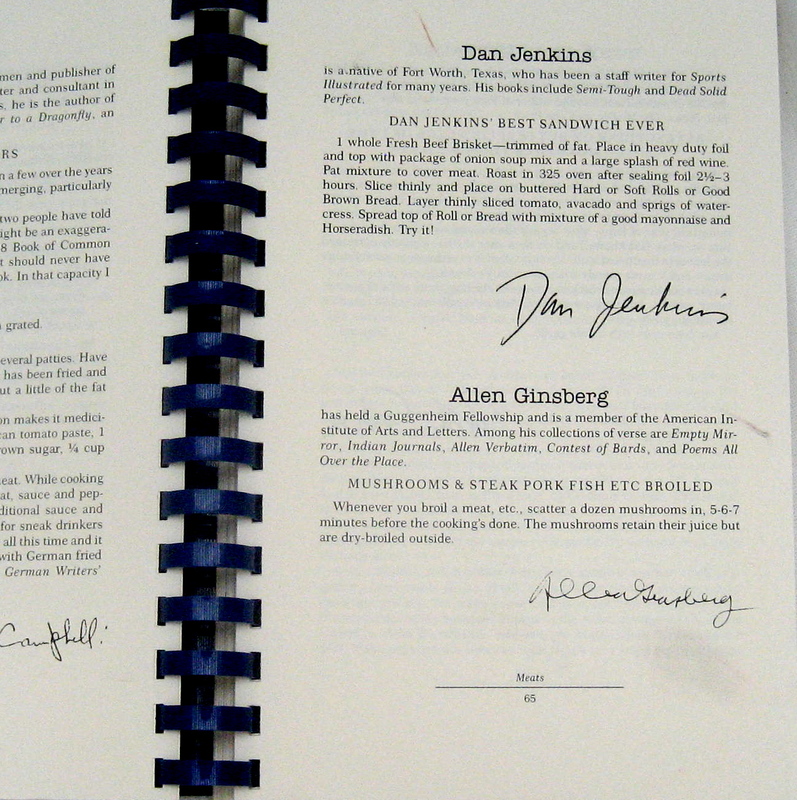 The 221-page book has an introduction by Craig Claiborne, which gives it legitimacy as an authentic cookbook, since he was both writer and chef. Although some recipes are more legitimate than others. Take, for example, Joyce Carol Oates' recipe for "The Career Woman's Meal" - "1 Campbell Soup can (any variety), 1 can-opener, 1 saucepan, 1 can water, 2 soup bowls". (and now you can see why I laughed). 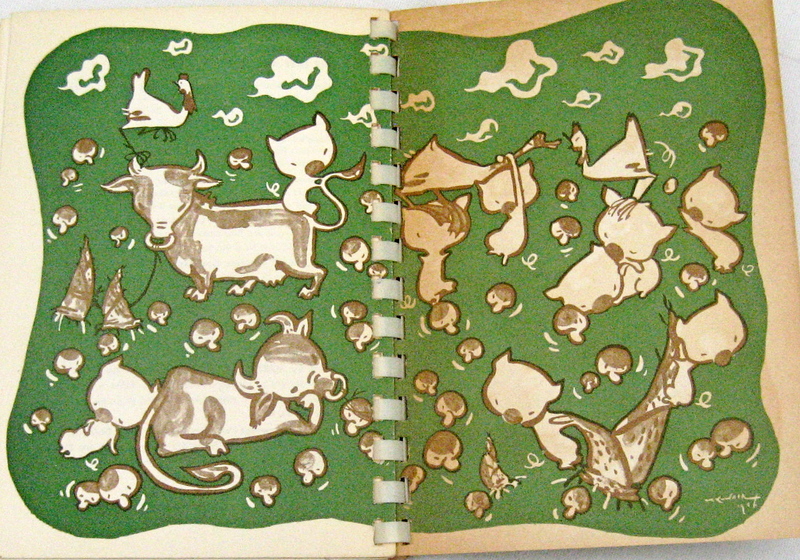 And how about Allen Ginsberg's "Mushrooms & Steak Pork Fish Etc Broiled"? He writes, "Whenever you broil a meat, etc. scatter a dozen mushrooms in, 5-6-7 minutes before the cooking's done. The mushrooms retain their juice but are dry-broiled outside." I think this recipe is a Howl - or, at least, a Hoot. Speaking of Mushrooms, one of the more complex recipes contained herein is from Norman Mailer :"Stuffed Mushrooms." This is a five-paragraph recipe, longer than I am allowed to quote in a blog, but if you would like more description, please consult your Larousse, as Mailer's Mushrooms are a derivative of recipes in that venerable French cookbook. Lest I leave you with the wrong opinion, there are, however, some fine recipes from other writers, including Tom Wolfe, who offers up his "Ten O'Clock Compote" (a breakfast dish) and Katherine Anne Porter's "Variation On My Feesh Deesh." (8 raw lobster tails, a pound of raw shrimp and a pound of raw scallops to start). Although I've owned and coveted this book for more than a few decades, if I didn't own it, I I'd surely want it - for one recipe alone: Hunter S. Thompson's "Open Face Cigarette Special Hot and Cold Sandwich With Artichoke Appetizer." This recipe is even longer than Mailer's, with a step-by-step guide to creating it, including "Drink good whiskey while boiling artichoke and frying bacon"... and so on. I suppose a glass or two of good whiskey might well pave the way for Dr. Thompson's finished dish, which consists of ingredients like cold cottage cheese, a can of Orega green chilis and toasted dill rye bread, among others. Perhaps I've whetted your appetite for the recipes, including one from the late Ernest Hemingway (it's a cocktail, natch) and, likewise, for those from William Faulkner and F. Scott Figzgerald. (Hint: none of the three required a stove). In the long run, all of these recipes have something to say about what writers put in their mouths when they weren't writing, or even when they were. Recently I noticed an uptick in one category of vintage books: Series books for girls from the 1930-60s. It seems many can't wait to load their bookshelves with original Nancy Drew hardcovers (in jackets, of course) and preferably, the older versions, the better (and costlier). Cost for original Nancy Drews seem to be no object these days. Think of that. (Nancy Drew book, last below, in original-though tattered- d/j is in the $100 range). 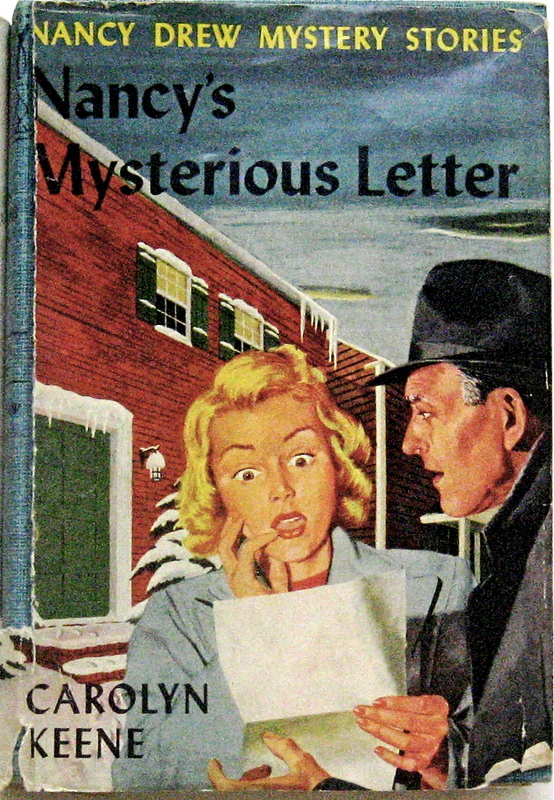 I've only managed to snag one or two early Nancy Drew mysteries in their original jackets, but I've had much better luck finding reasonably-priced, popular pictorial (laminated) girl detective series from the 1940s & '50s,. These books starred other female detectives like Donna Parker, Ginny Gordon, Trixie Belden, Polly French, the Dana Girls and Judy Bolton. One of my recent favorites, for more than one reason, is Ginny Gordon in The Lending Library Mystery. Even more attractive than the vintage prose of these girl-sleuthing books are the colorful covers . Most of them feature young women aggressively pursuing some one or something other than a chocolate soda at the Malt Shop. I'm not 100% sure (maybe only 79%), but I think the popularity of these books of the past had something to do with changing girls' opinions about what they could to do when they grew up. As in, marriage was not the only option. In most of these series, finding a boyfriend was not nearly as important as finding a secret key or a hidden staircase. And there you have it: yet another likely reason for the feminist movement blossoming in the 1960s & '70s when young women like author Sue Grafton were sharpening their pencils. Lately, many of us (thanks to reality TV) now believe the American Dream (whatever that is) can be ours by winning a singing or dance contest or picking the right Bachelor or storage locker full of antiques. Suddenly, as TV confirms, we're rich or famous or hopefully both. It looks so easy now, doesn't it? Well, maybe that's how it seems today, as so much reality TV is, in reality, scripted. 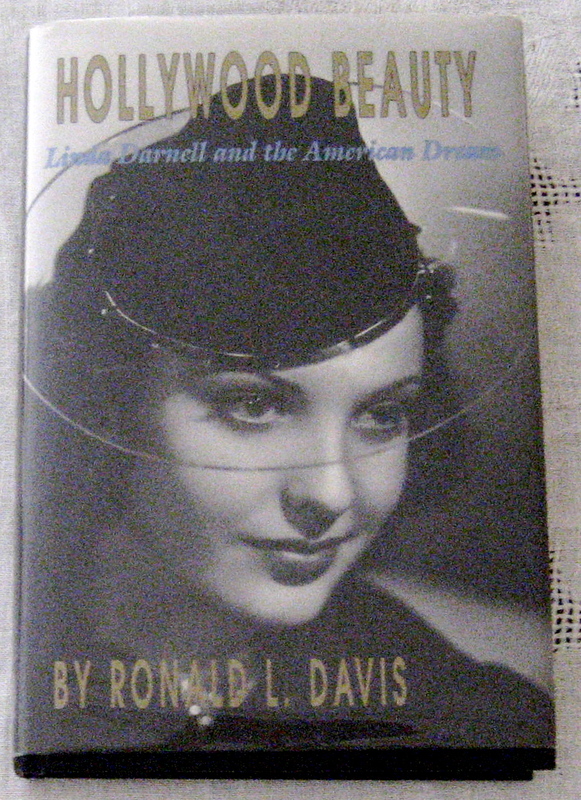 But the route to the American Dream was much rockier in the 1930s and '40s, when young girls dreamed of movie stardom in Hollywood - a place, for some, that is still the epitome of greatness. 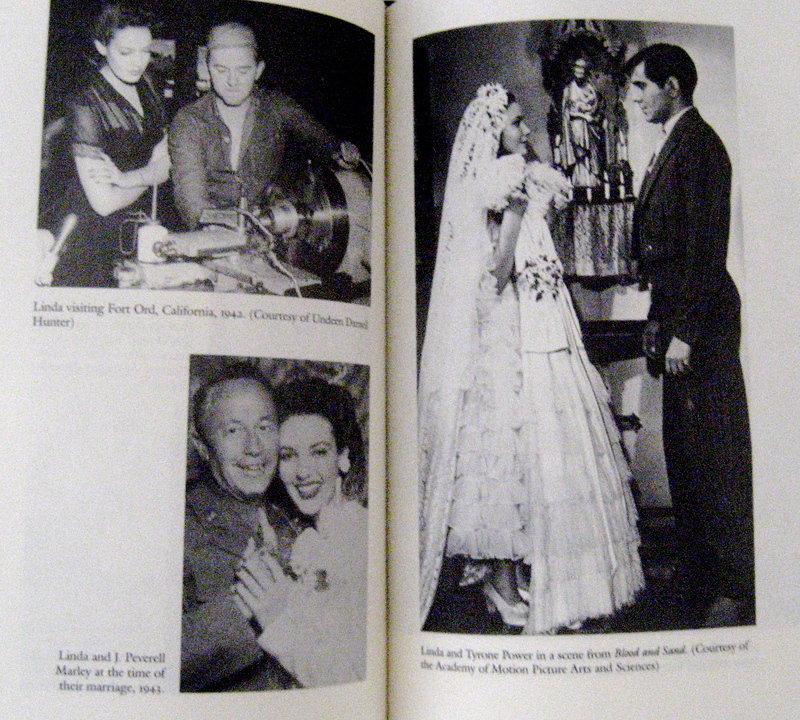 Hollywood Beauty, is the biography of Linda Darnell, the late, ill-fated film star of the 1940s. It is surely as riveting and striking as any book of fiction I've read of late. Here, the truth is Stronger than fiction, tracking the life of "a naive teenager from a dysfunctional middle-class family" as she lands in Hollywood during its glory days and big studio star-making machines. Darnell's life is not strictly a rags to riches story. As it unfolds, it becomes a cautionary tale about Hollywood's single-minded focus on fame, and how quickly the star-makers can build you up and tear you down, seemingly at will. This is how dreams become nightmares. And, speaking of nightmares, although little is made of it in this book, shortly before she died at the age of 41, Darnell told her brother about a scary dream she had about dying in a fire. Days later, she was dead, the result of extensive burns suffered in an accidental fire at a friend's home. Linda Darnell's most famous movies can still be seen, and they include Star Dust (1940), Blood and Sand (1941) Forever Amber (1947) and A Letter to Three Wives (1949). She also appeared on TV and on stage in the 1950s and '60s. 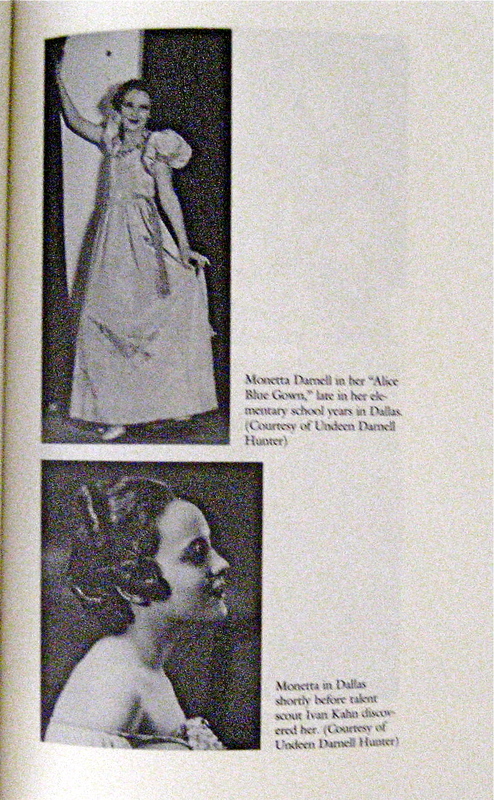 Her biography was written by Ronald L. Davis, 1991. 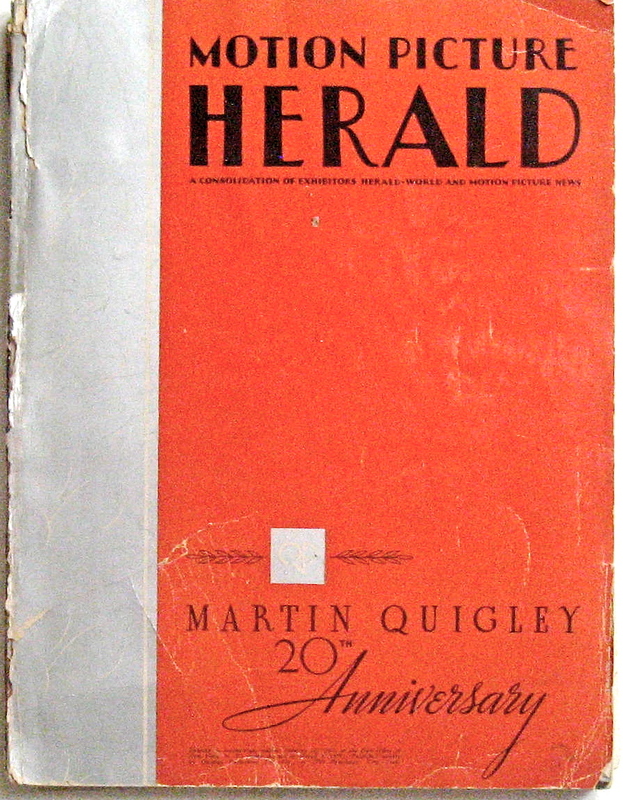 The copy below is a First Edition. This book, by author Martin W. Sandler, offers a short course on the history of American jobs, 1880-1920. 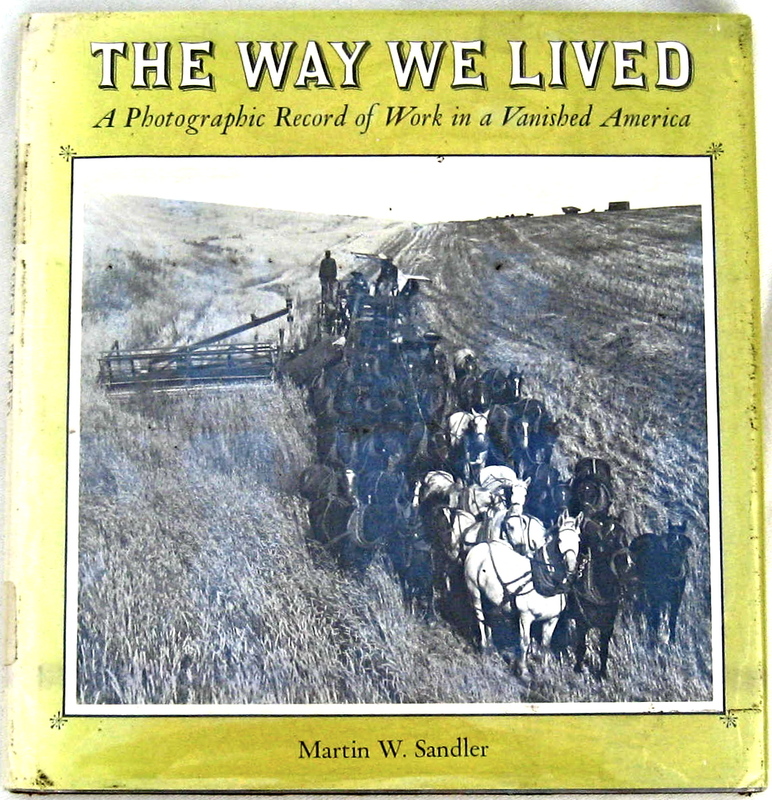 Sandler's own amazing collection of antique glass negative photos illustrate his survey of American workers - from the farm to logging, mining and eventually to factory labor. 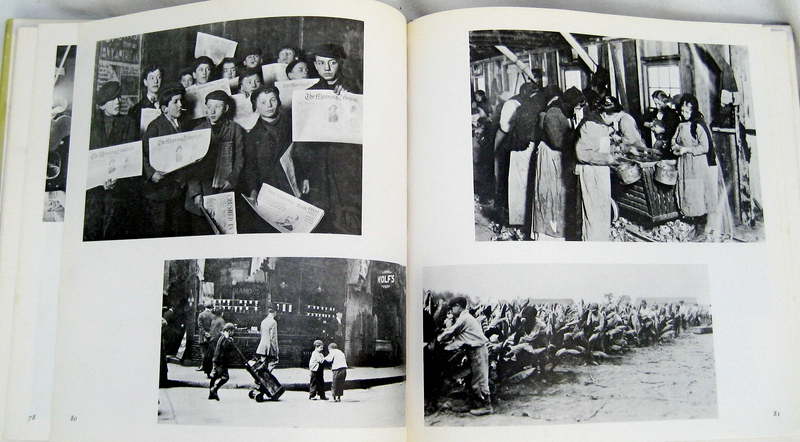 Along the way, the book offers riveting views of children (some two million worked in mines, on the streets, and in factories) as photographed by Louis Hine. Interesting to note that in the 1880s, the average employee worked 10-hour days, 6 days a week. Eventually, some farm hands left the fields to find work in urban areas in the factories churning out cars and goods. But farming remained the biggest source of jobs. After farming, more people worked as servants (nannies, maids, drivers) than in any other occupation. As the Industrial Revolution took hold, a larger urban work force needed more goods and services. These goods were supplied by a growing retail sector. 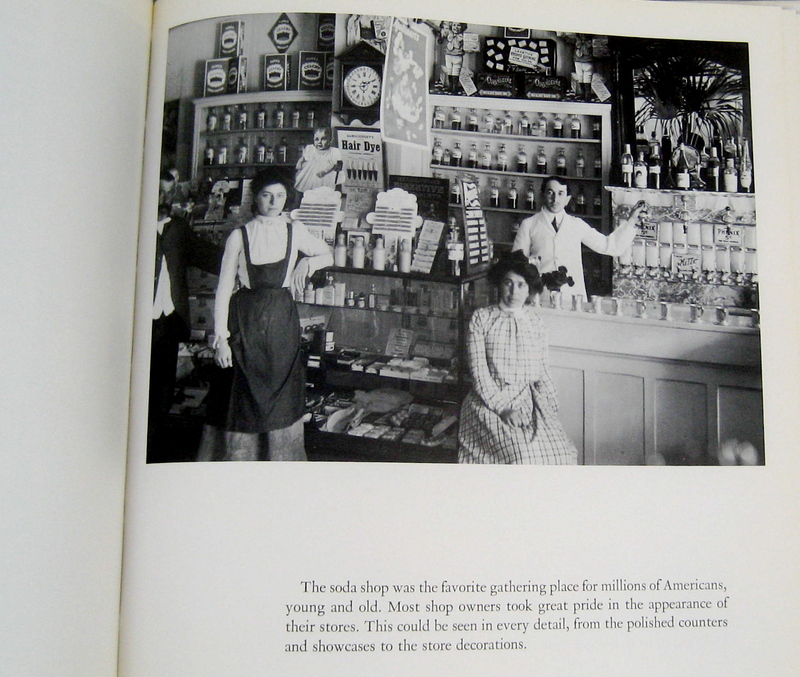 Stores moved from inside private homes to shops on busy city streets. My copy is a first edition, but it will not to be sold, since it is a library book. I plan to keep it in my own library. Thank God for libraries. 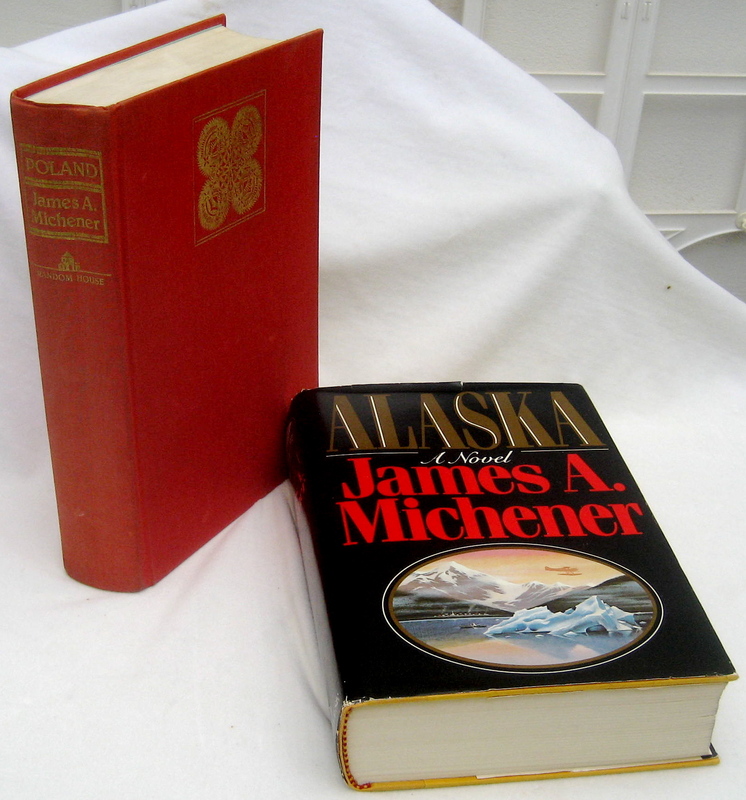 I never was much of a fan of James Michener, although he certainly was one of the 20th Century's most prolific authors, if not THE most prolific. Starting with The Tales of the South Pacific and continuing on to more than 40 books about countries spanning the globe, he took his many readers on detailed journeys, sometimes meandering back thousands of years to ancient times. I read only one of his novels - Hawaii - and I remember it took me most of a long, hot summer to get through it. It was a reward in itself to finish the massive book. I never looked back or read another Michener. 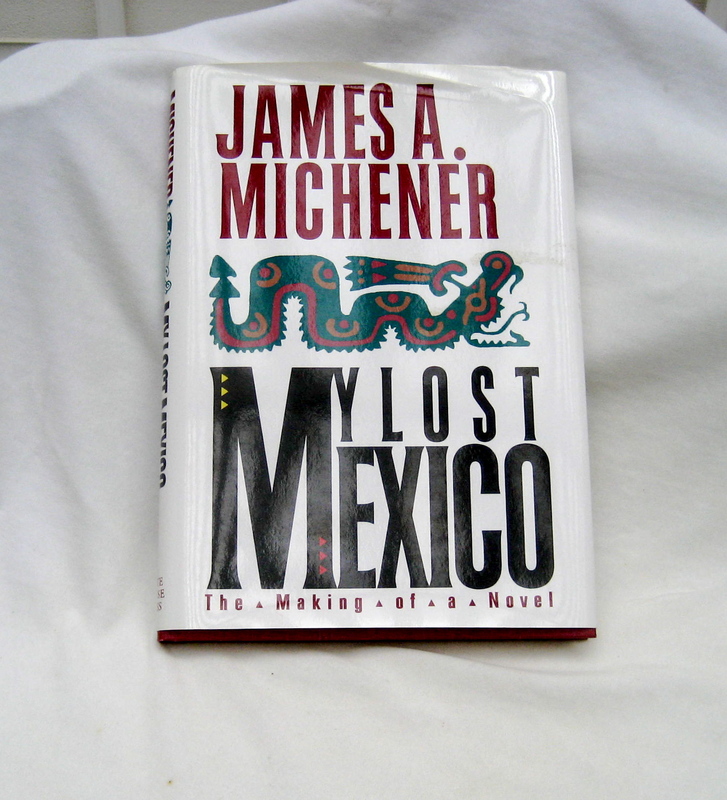 That is, until I found My Lost Mexico, (1992), a slim book (more to my liking, see above) describing how Michener resumed writing his novel-in-process, Mexico, some 30 years after he stopped writing it. The manuscript went missing, and only after his agent and the publisher nagged him about completing it, did a synchronicity occur. In a corner of a storage room, Michener's cousin found the draft of the book and the many photos of Mexico and Spain that Michener snapped in the 1960s. And so, he went on to finish what he'd started. And not only that, he wrote another book (above) about what caused him to stop writing (Publisher Bennett Cerf's gentle suggestion to correct a segment). Surprise! I'd never imagined an established author like Michener could lose his confidence over a mild suggestion to revise his work. But lose, Michener did - both his confidence and his manuscript. In describing how he re-read the draft of Mexico, completed it and revised it, as Cerf originally suggested, a reader can see the painstaking research, notes and outlines Michener undertook - both in the 1960s and later,in the 1990s. Copies of his copious notes to himself and his many chapter outlines, as well as his musings about adding and subtracting characters, confirms just how hard and how much he worked at his art. 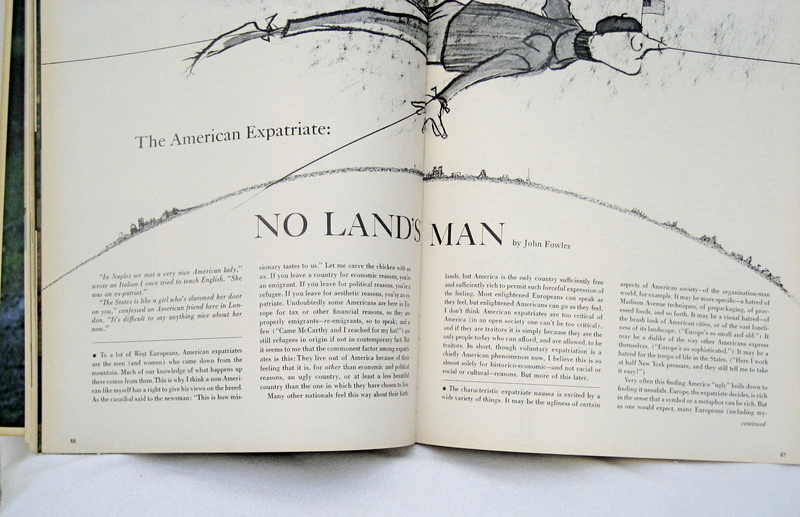 If anything, after reading My Lost Mexico, my admiration for this genius globe-trotting author soared. Both gifted storyteller and historian, his work endures.